With summer in full swing here in the Northern Hemisphere there’s a lot to cover here on the MarketWatch. Between it being prime season and seeing a general uptick in prices over the course of this year, there are several notable auctions to cover. 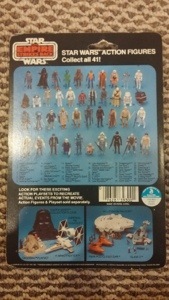 This month we cover off a small variety of some of the items that we saw on the market over the last 30 days, including a quick overview on some crazy prices realized on some pristine 12 backs, a few unique and rare auctions including a crazy Luke Bespin figure, and a short overview on a few rarely seen Force Light sabers that hit the market. All in all it’s a great time to be in the market as a seller, a buyer or a collector as prices are hot and demand is high. With that let’s get to the meat and bones of this month’s MarketWatch review. All in all I don’t spend a lot of time on the blog talking about the 12 back series. 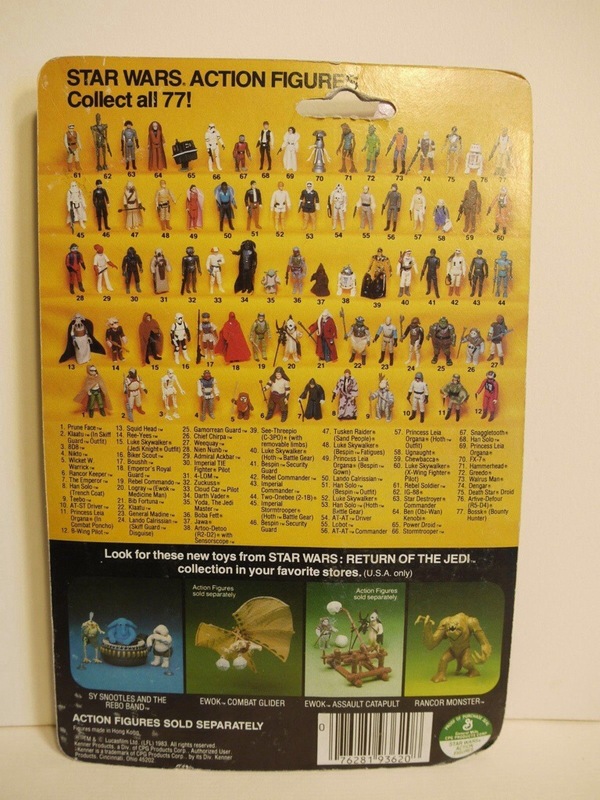 Though it represents the Genesis of the toy line, its large production number makes it readily available and thus easily reference-able given the number of MOC figures available in the market. At any time someone could put together a run of the original 12 within a few weeks if not days, just relying on eBay auctions. 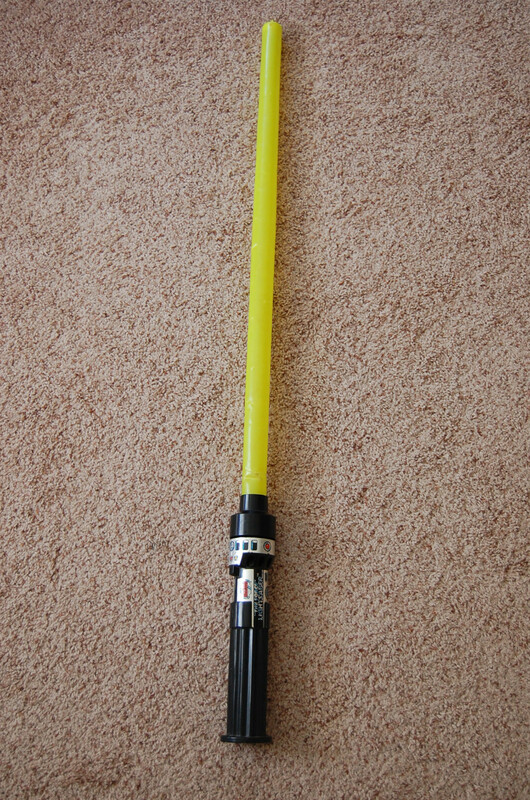 Of course there are exceptions to this rule, including the Double Telescoping Lightsaber release figures. This month we have two for reference. 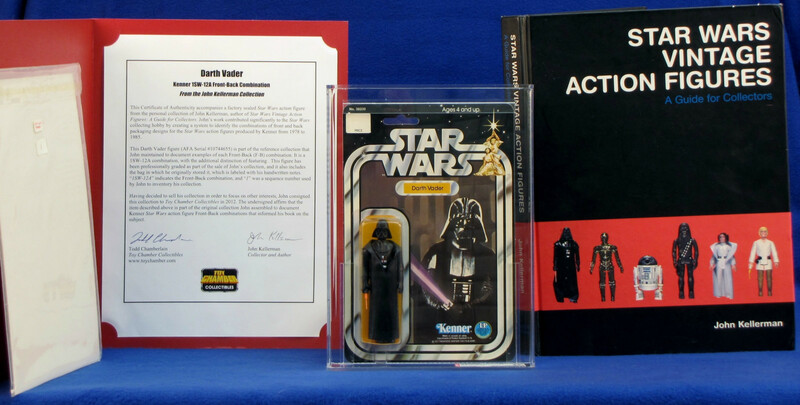 First the Double Darth Vader, truly one of the most difficult figures to find MOC, it’s ending price of $30K for an AFA70 example is the most impressive of this month’s auctions. With only a handful of examples in existence this is truly the center piece of any collection and proof positive that vintage prices are continuing to rise. In addition to Luke there were several other AFA90 12 back examples this month that were impressive to say the least. 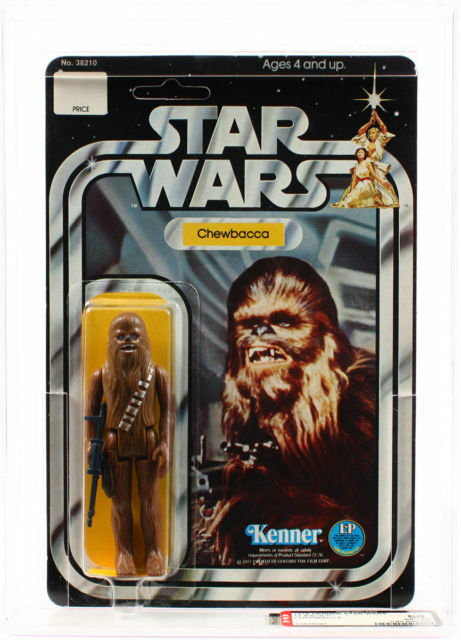 Right behind Luke was Chewbacca, with a price of $9077 this could have also been in the crazy auction category for the month, but it just shows people really want the first and best example of figures and many will pay a hefty premium in order to get what they are looking for. 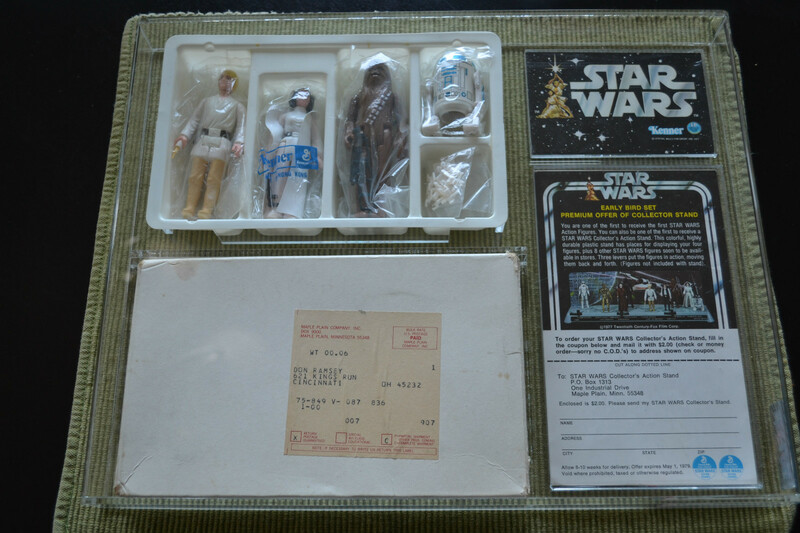 Following the trail we have C-3PO and Han Solo both of which sold for bargain prices in comparison to the aforementioned auctions. 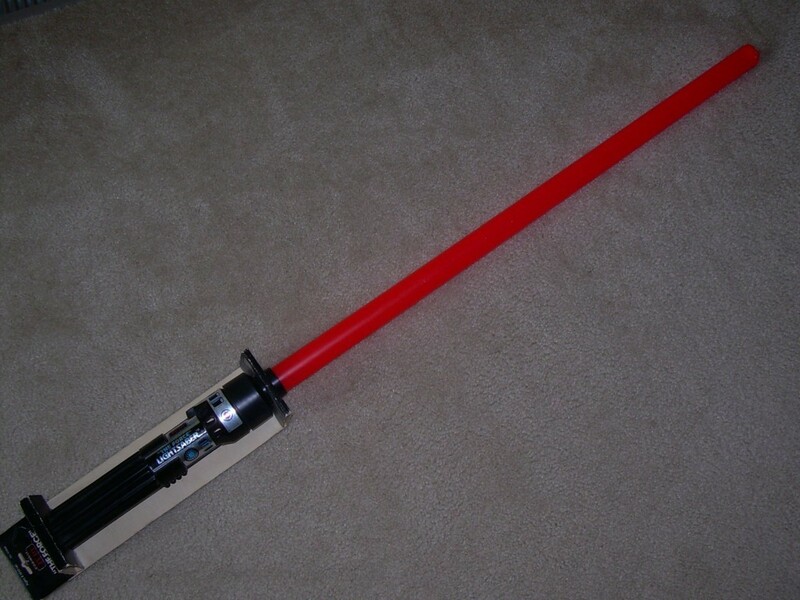 Although not the most sought after of the Vintage Star Wars line our next batch of auctions does fall under the category as some of the most recognizable items from the vintage line, that being The Force Light sabers. 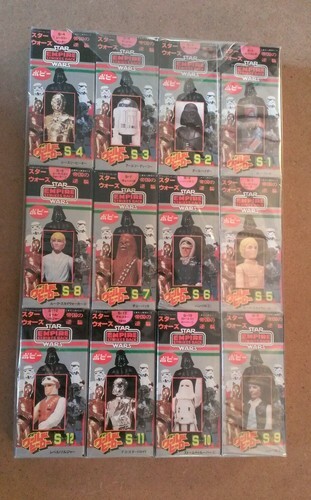 It’s always amazed me that any of these survived through the years in loose condition, much less packaged. I remember whenever I saw them in the stores there were always kids having battles in the aisles and so many were broken before they were ever sold. Though some did survive they are definitely not common especially in the package. Thus when I saw three decent auctions comes across this month I just had to share them with the rest of the community. As most who come to the blog know I’m a sucker for the Vintage 3 Packs. Thus when I saw this great example of a Villain Set I had to make a mention. Not only did it go for a great price it’s condition it superior to most examples that I’ve see on market over the past years. We’ve seen one of these 6 packs come through earlier this year, but condition was lacking in comparison this example. By far the rarer of the two 6 packs released for ESB, this red version is still sealed and saw an incredible price realized. Always a cool item to see come across the market this particular piece may have been my favorite auction this past month. Now here’s a crazy auction to end our update for July with. 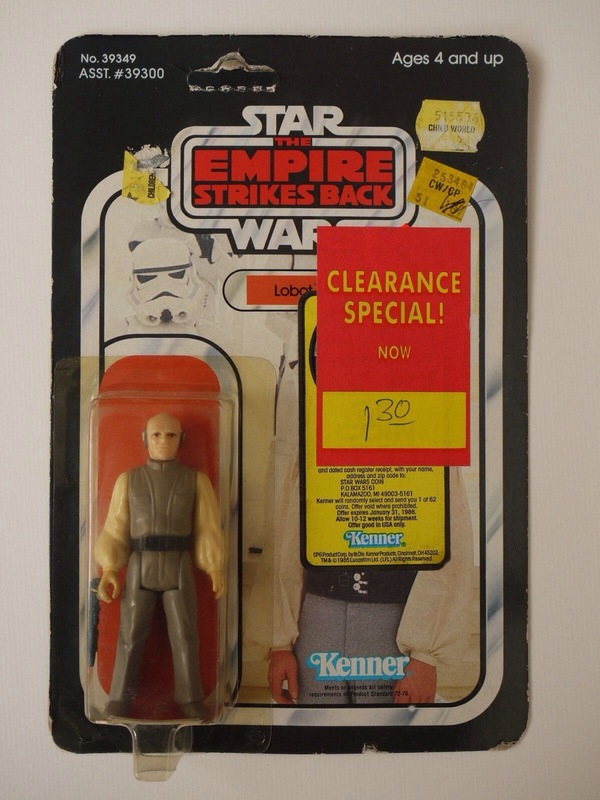 There have been a few threads started across multiple sites like Rebel Scum pointing out incredible prices being seen across Vintage auctions on eBay. And all in all the threads paint a very accurate picture of what’s been going on with certain pieces seeing incredible price increases in a relatively short period of time. This Luke Bespin is a great example. Although one of the favorites of the Vintage Line, due in part to the short run on this cardbacks artwork, these pieces always hold their value. However when I saw this auction’s ending price I had to make mention that less than a year ago this piece was selling for less than half of this auctions ending price. We saw C8 examples selling for $2-350 and graded examples selling for $3-500 consistently just last summer. Thus a doubling of value year over year is quite incredible, but also quite crazy if you ask this collector. 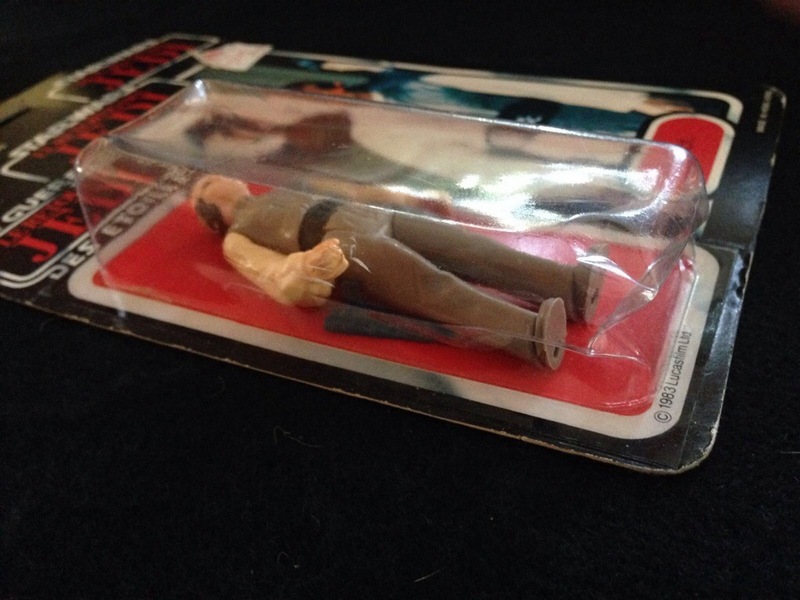 That brings us to the end of our coverage of the market for this month, comeback next month for coverage on a massive run of ROTJ 2 Packs, POTF MOC goodness and a lot more. Happy May (Okay early June) Space Freaks! As Spring turns to Summer we have a great line up of high end and rare auctions on this month’s general Marketwatch update. I mention the change of the seasons because it truly signifies a change in the market as well. Spring is typically one of the slowest times of the years in terms of overall transactions and variety of available pieces. It’s easy to say that there is greater focus on selling and buying from June to August given the number of auctions and drastic upward trend in prices realized. Thus we start my favorite season of the year, this my friends is hunting season for us! Before we see the turn it’s amazing to see some of the great deals for items that have hit the market in late April and May. Across the board we saw great deals on items that seldom come up on the market as well as some staples of the hobby that saw great deals for buyers in the market. One set of auctions that I’ve neglected to touch on was the series listed by a seller on eBay with the username Earlyretiree, very aptly put if this was truly someone that had been storing these through a number of years. I’ve copied a link to the auctions here –Early Retiree Auctions You can see for yourself some of the great items that were up at one time, this was a very cool and infrequent occurrence, although prices seemed to wane on the high side. We really had to narrow down the items for this month to a handful of individual auctions, each of which is unique in its own way. With that I hope you enjoy the findings. 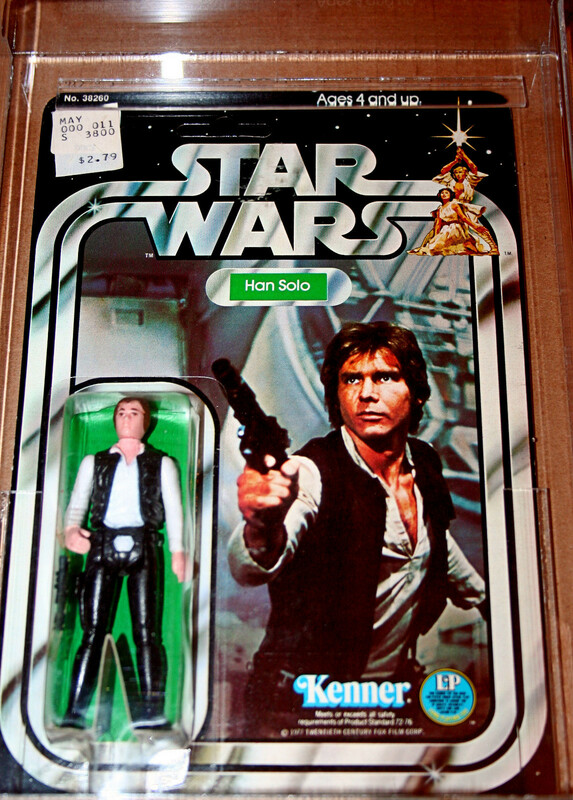 Han Solo Bespin ESB Spain – $5611 – Han Solo Bespin – Spanish Wow, another piece of Spanish goodness for us to savor. This particular piece along with it’s other Spanish brethren fetched seem to be fetching hefty retails as of late; and this one is no exception at $5611. 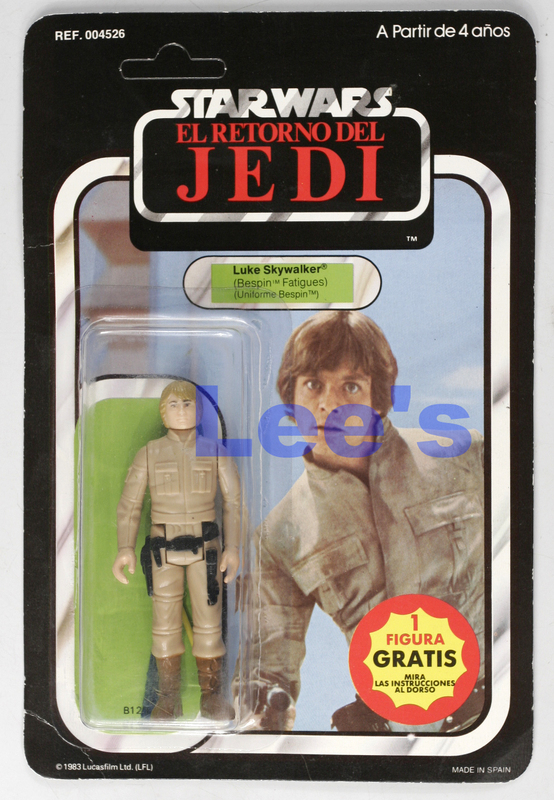 Quite the nice appreciation from the 200 Pesetas this would have gone for at retail back in the 1980s. 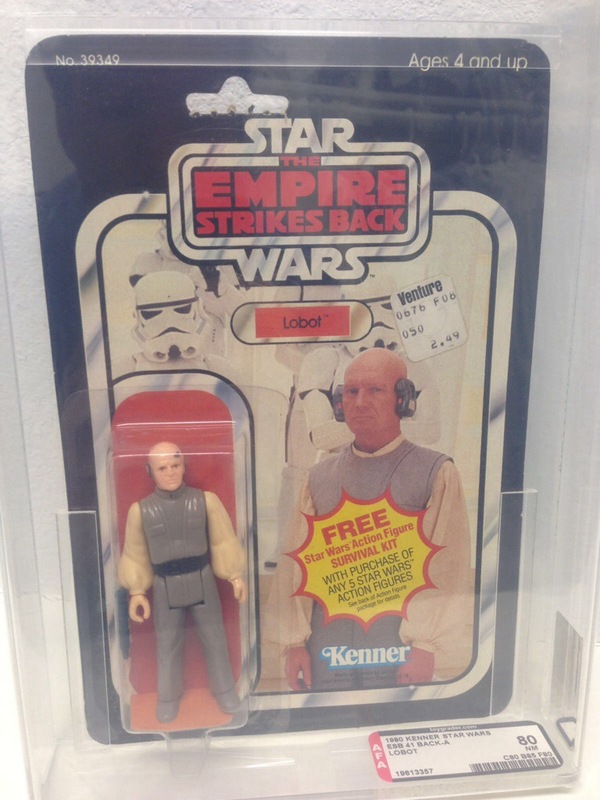 Han Solo Hoth – Spanish – $4500 or less…. 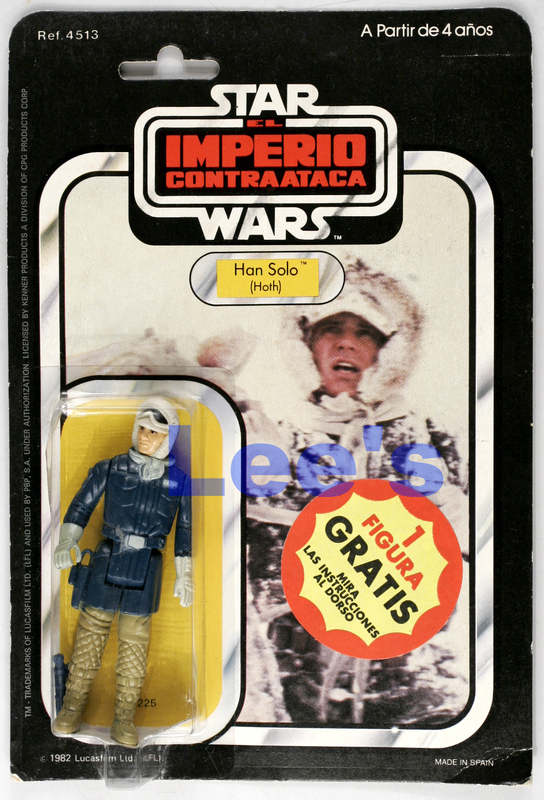 – Han Solo Hoth To go along with our Spanish Han Bespin auction, we have the same Spanish version but this time for Han Hoth. Like the aforementioned auction this item saw a BIN price of $4500, with an actual price that more then likely wasn’t too far off the mark. 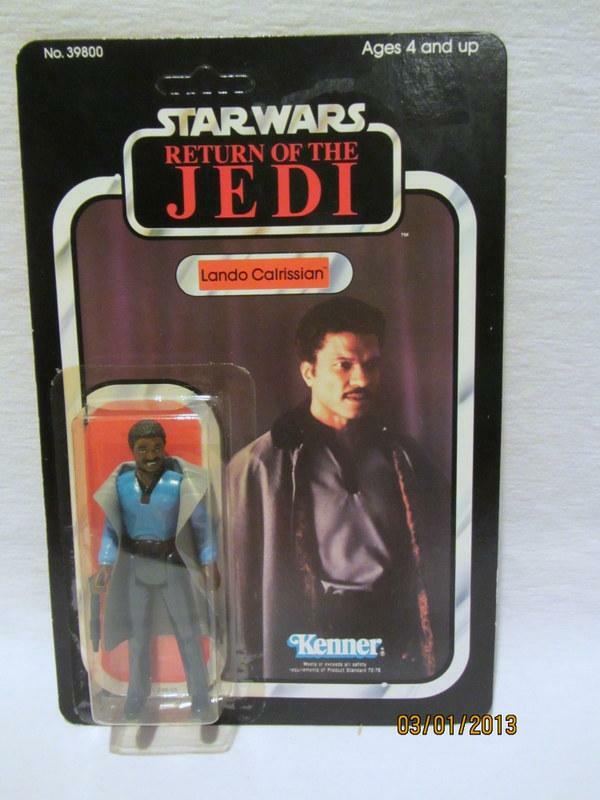 Both of which eclipsed the selling price of the Luke Jedi version we covered in April. Leaving all of us to wish we grew up in Barcelona in the 1980s. 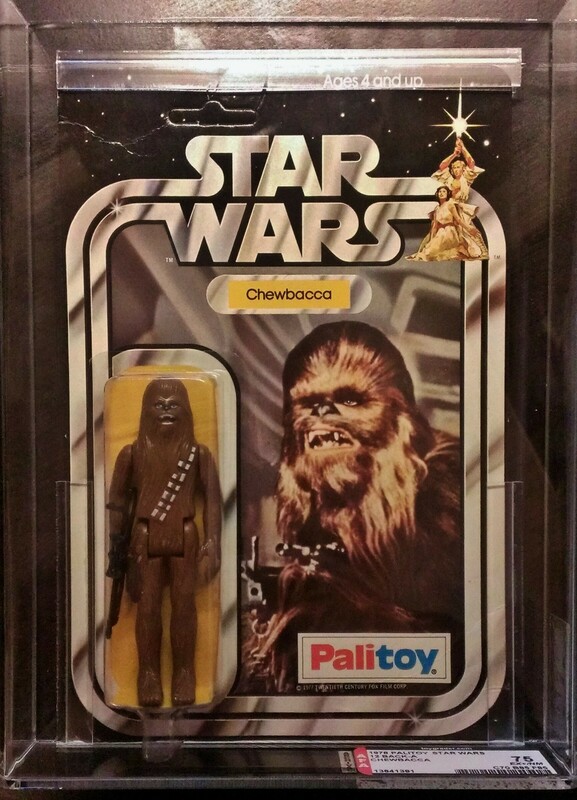 Chewbacca Palitoy – AFA75 – $5549 – Chewbacca Palitoy One of the highest price Palitoy MOC auctions of recent past, this Chewbacca saw an incredible price realized. Rare and in high demand, this piece is one of the most difficult MOCs for focus collectors to find. Chewbacca while a fan favorite doesn’t seem to command the prices that we see with several other characters such as Fett and Vader, but this example was definitely the exception to the rule. 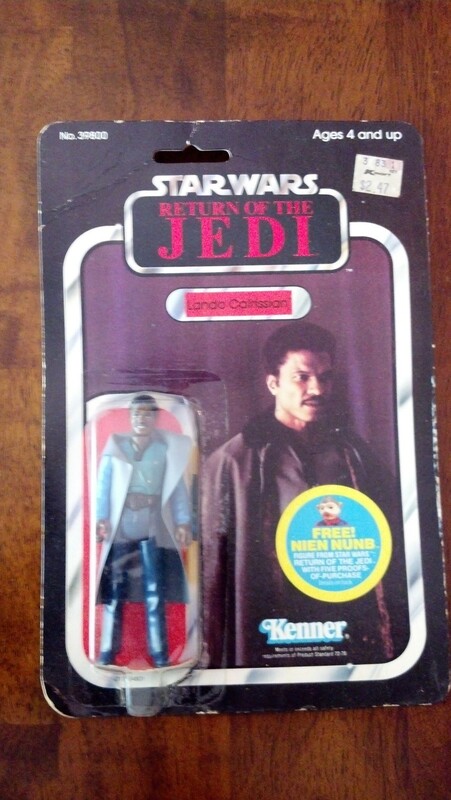 A great piece with a great character that lead to an incredible price. 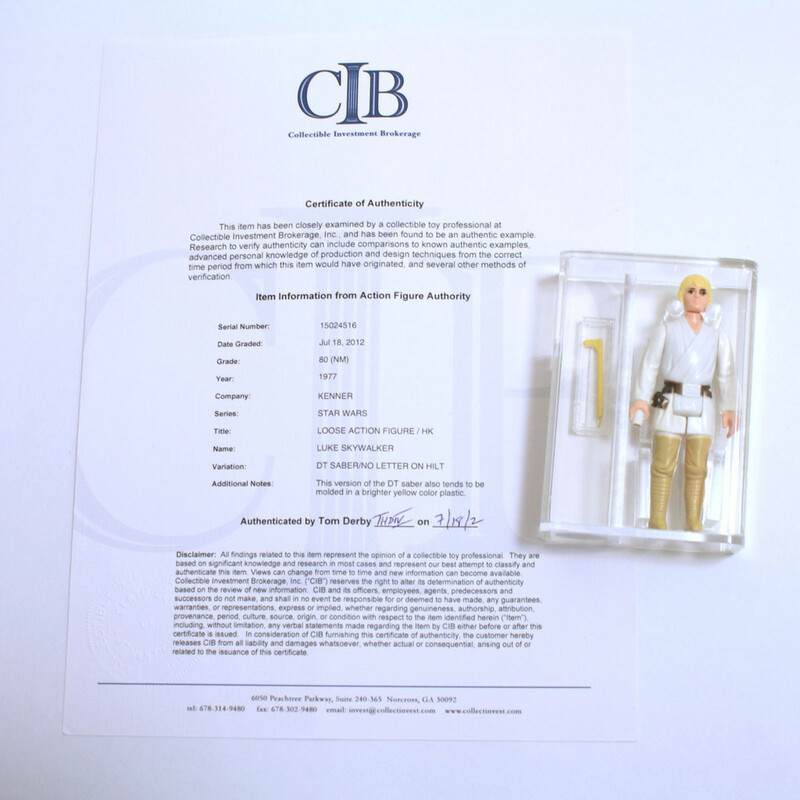 Luke Skywalker Double Telescoping MOC – AFA85 – $13,500 – Luke Double Telescoping MOC Auction Keeping up with high end MOC auctions we move into the highest price item of the month. 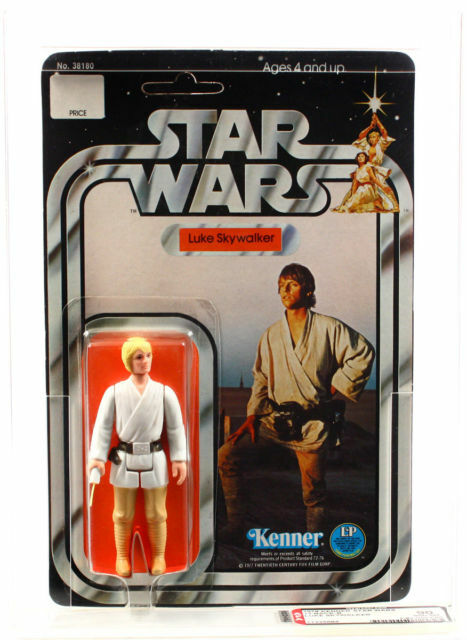 Although we’ve banished the loose figure to the HOF, the MOC version of Luke Skywalker with a Double Telescoping Lightsaber will remain a featured item when we see them arrive on the open market. This particular item is in pristine condition with an overall grade of AFA 85, which helped this item realize a price of $13K+. 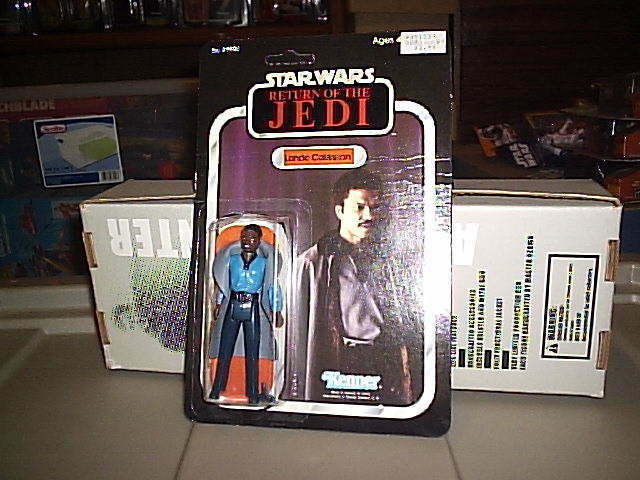 The carded Double Telescoping Lightsaber figures are quite the rarity in the overall scheme of Vintage Star Wars. 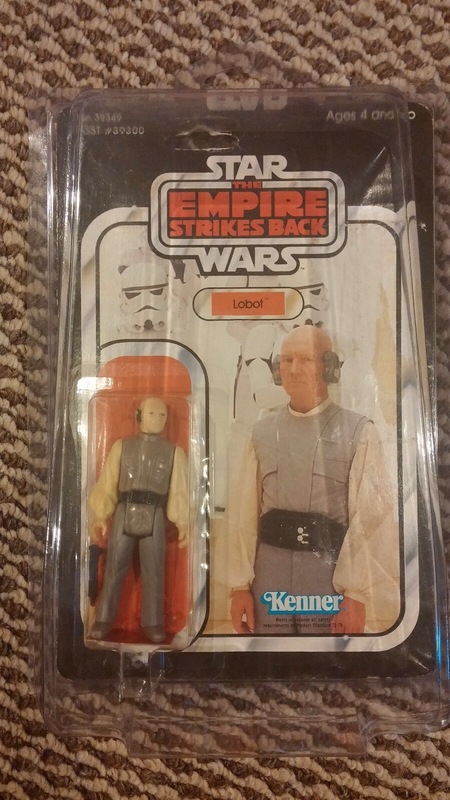 Along with Ben Kenobi and Darth Vader (Both rarer in DT format), this piece is truly a grail to a many collectors and fans alike. Thus it’s important to document and showcase this item for future reference. Maybe we’ll see one pass the $15K mark in the near future. 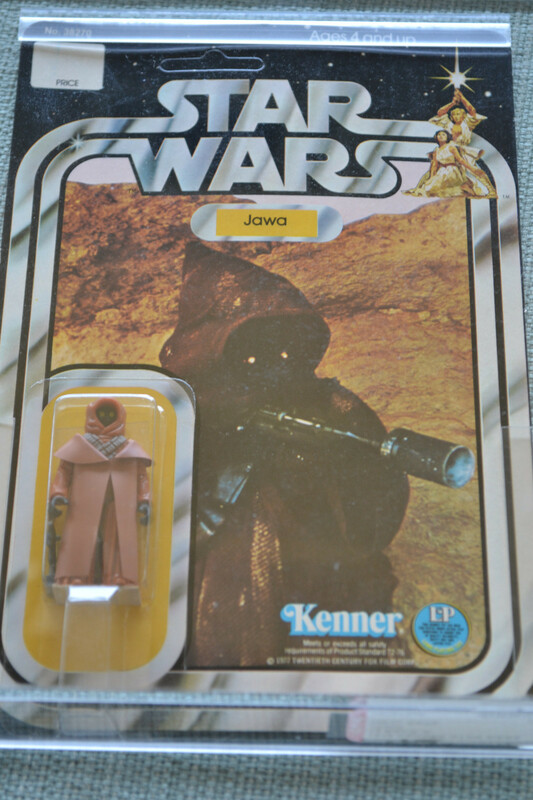 Jawa Vinyl Cape – AFA85 – $5900 – Jawa Vinyl Cape MOC Auction Not too far from the HOF the Vinyl Cape Jawa has become a regular on the MarketWatch, between the rarity, the demand and the price it gets covered quite often and this may signal the last time as it’s the third appearance on the Marketwatch in the last year. Regardless it’s always nice to highlight a VC Jawa on the MarketWatch update, and with that let’s push this one to the Hall of Fame! 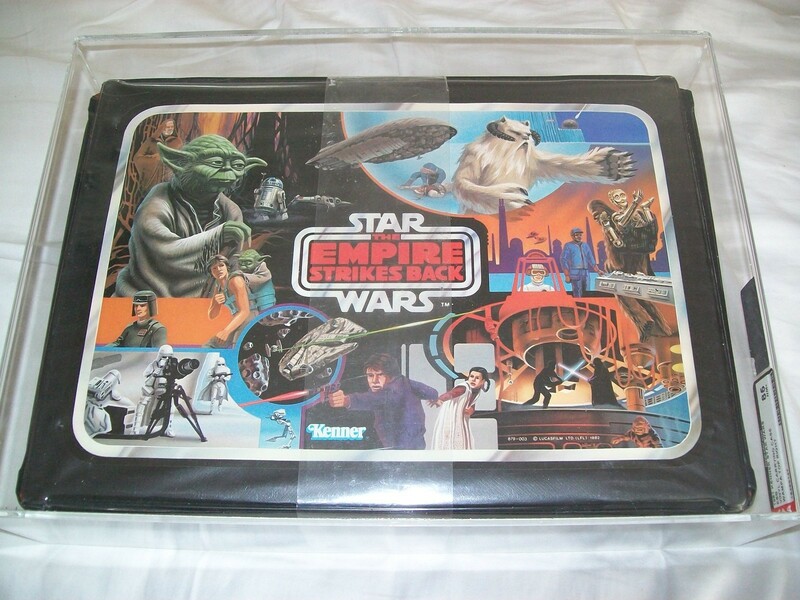 ESB Vinyl Case – AFA 85 – $560 – ESB Vinyl Case One of my personal favorites the Empire Strikes Back has several personal favorites when it comes to releases unique to that movie. 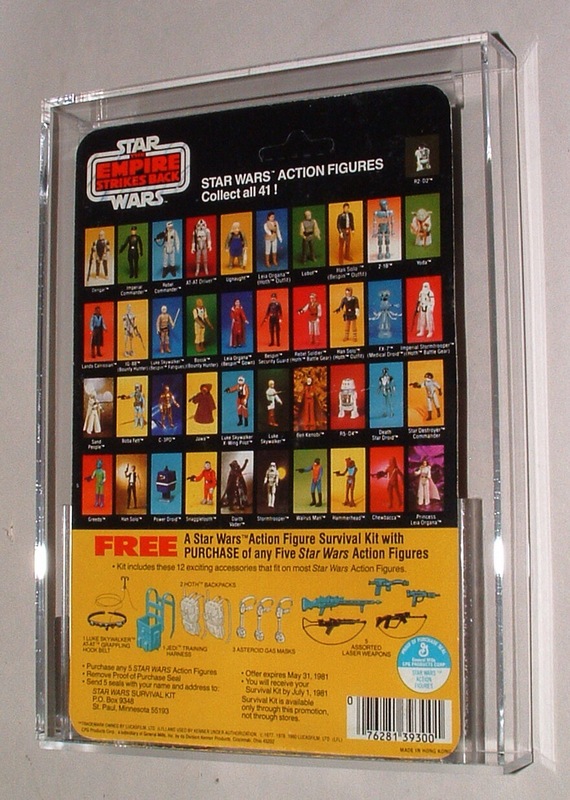 You have the introduction of the At At and Scout Walker, Slave 1 and so many unique backdrops that were made into toy associated items. 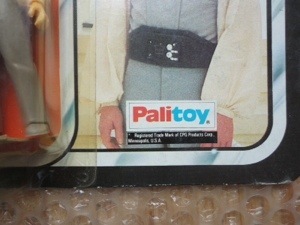 Something associated with each release is the vinyl carrying case with imagery from the movie on the front. This particular one does an incredible job at capturing all of the unique situations that we saw unfold in Empire. 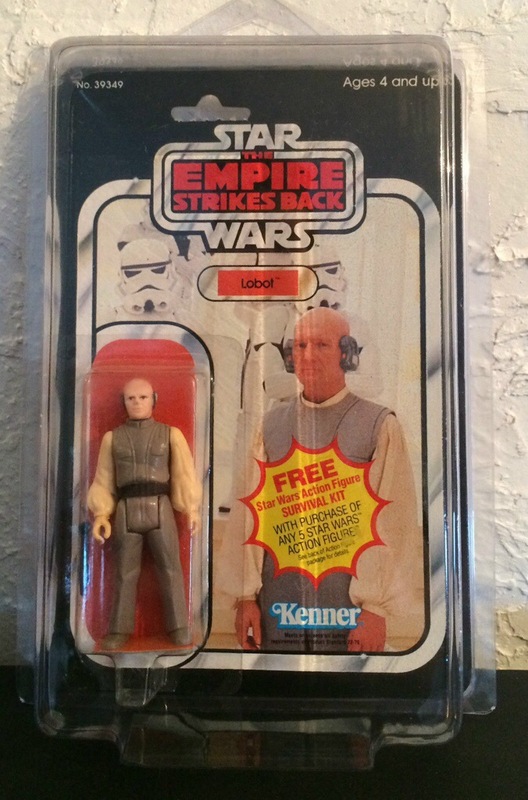 The artwork is exceptional in detail and truly one of the best cases put out by Kenner during the vintage run. This one sold for a fairly high price given the market this time of year, however it’s a high grade example and other AFA80 examples have seen prices of $300+ in the past few years. Day of week = Thursday one of the worst days of the week to sell based on historic prices realized. Time of day = Not the worst considering it was in the afternoon in the states, but later in the evening would have been best. 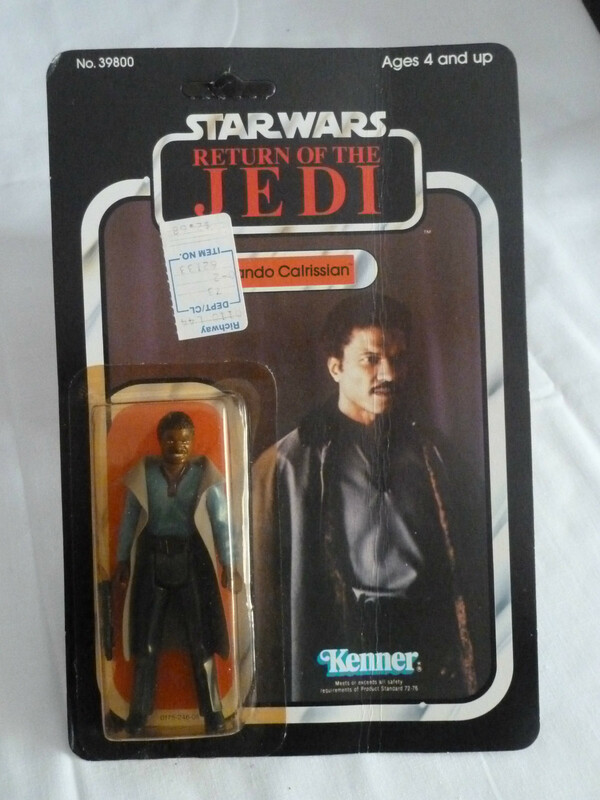 Niche markets and ultra-rare items like this have some volatility. Condition is everything and the difference between the best of the best and 2nd best is quite a rather large span. Simply put there aren’t many variations in condition but the tape is yellow and the box is a little more beat up then the example we saw last year. Thus I wouldn’t put this as the main driver of variance in price between the two auctions, but it definitely impacts the price overall. This auction probably isn’t the best example to support this point I wanted to convey, but what I want to convey is that the price difference between an 85 and 90 is consistently greater than that of the price variance between and 85 and 80. And when you’re dealing with high demand examples this holds true as well. All of these components work together to the advantage or disadvantage of the seller/buyer depending on which side of the coin you’re on. And they’re key to the environment that we collect in, thus if you take nothing else away from this update (outside of the great items), take these three points to heart. The time (Season-Day-Hour) that you sell an auction has a tremendous impact on the price. The price variance from the best condition to 2nd best condition is usually the biggest price variance in terms of overall condition. Niche items have more volatility in pricing due to the limited number of collectors in the market. There was a good assortment this month. 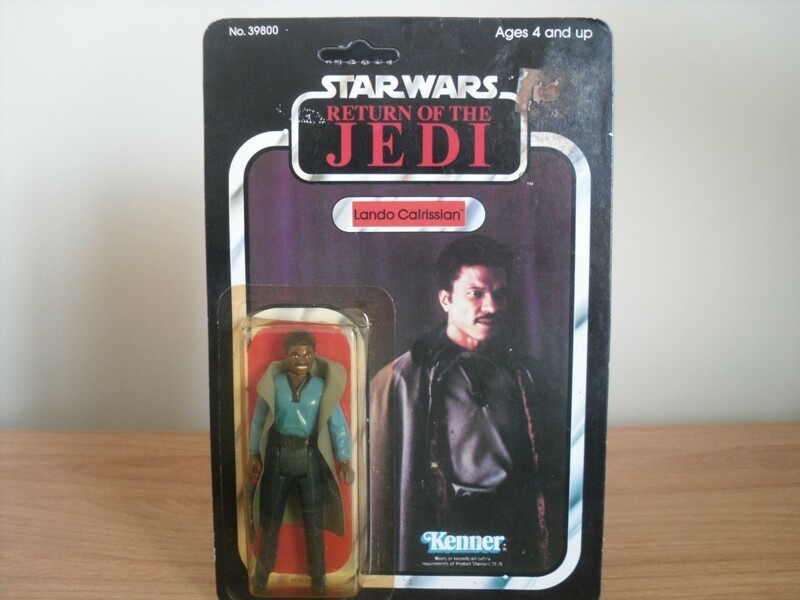 I was a little late in publishing this update onto the blog so took the chance to add a little more data on Lando. I actually tried to go without any AFA examples, but had could only find a 31 back that was graded. 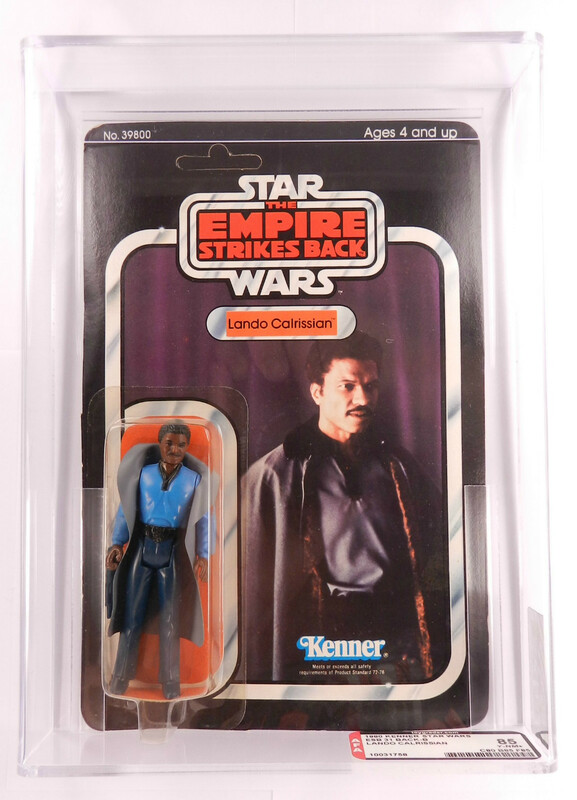 All other figures were ungraded and looks like a Lando ESB MOC will set you back about $90. Though I was able to add in the 47 back which went for just over $200 as part of the eBay listings posted by “earlyretiree”. 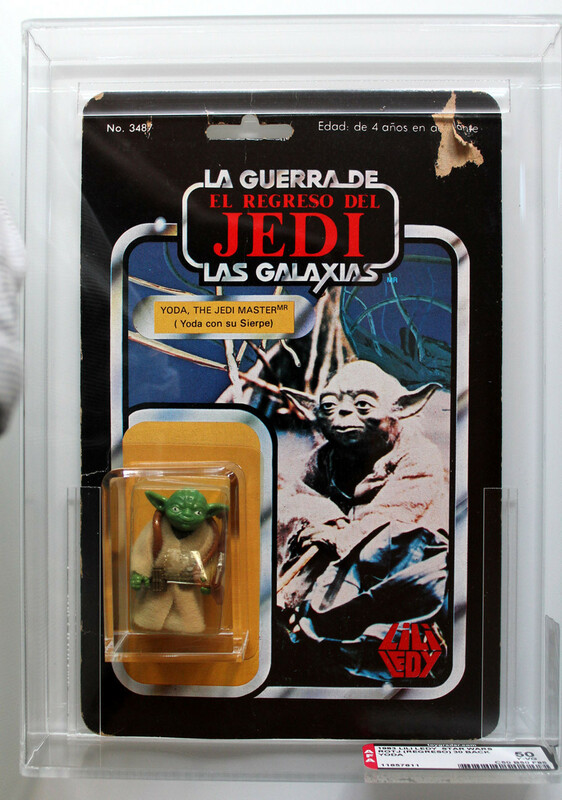 The ROTJ examples were very cheap – though most cards were in fair to rough condition. Seems like a good value figure – for what is a pretty central figure. It’s always interesting who they pack together in these packs, I think packing him with Han in his trench coat is a decent combination. 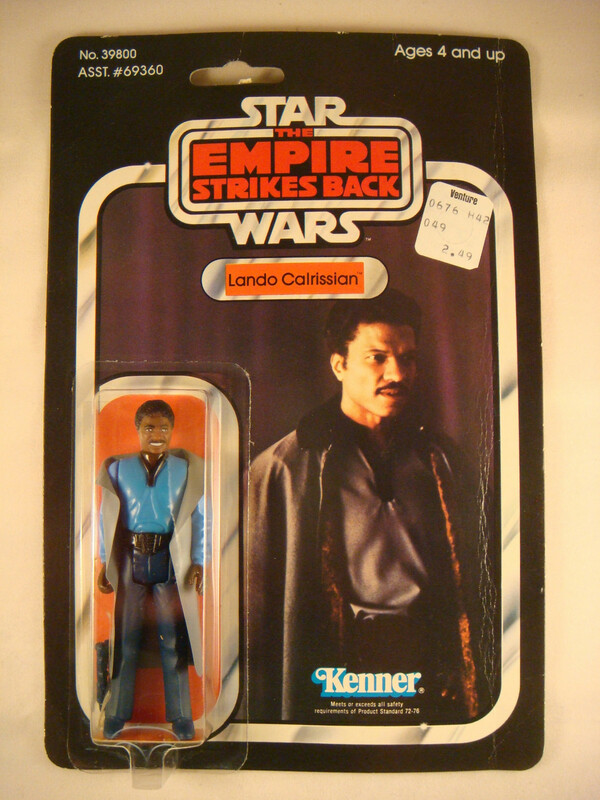 Though seems there was more demand for Lando packed with Teebo – not quite as appealing in my view. Round Up – Noteworthy Auctions without the full write up. Rather than waxing intellectual about the subject let’s get right into the awesome items we’ve seen pop up in the market over the last month. Well for the first time we’re not just covering an item, we’re also banishing it from any future Marketwatch segments. Given the number of times we’ve seen him pop up in the market over the past year we’re starting a new section of our Marketwatch, that being the Hall of Fame. After an item makes the MarketWatch 5 times we are moving the item to Hall of Fame Status, where the item gets the honored distinction of never being mentioned on the MarketWatch again. 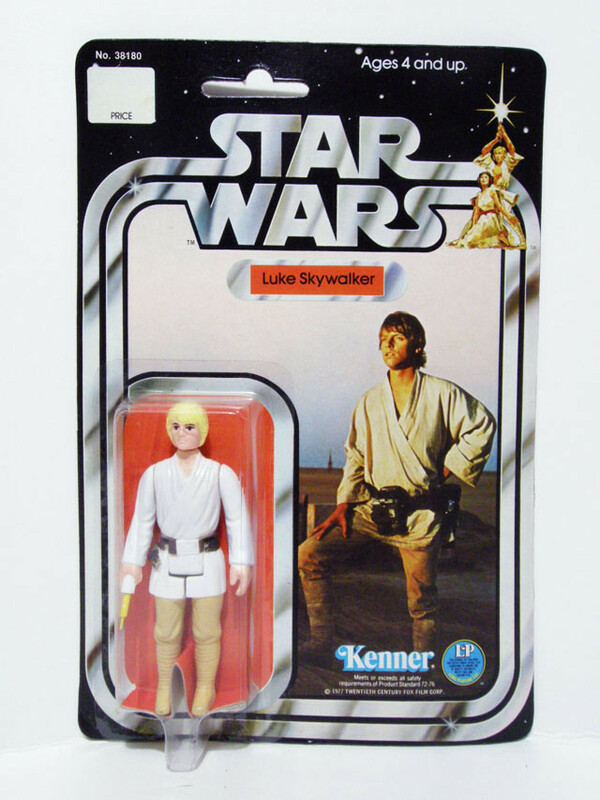 And our first inductee is…..Double Telescoping Luke Skywalker – Loose. He’s been on the MarketWatch so many times that it’s time to say goodbye forever. 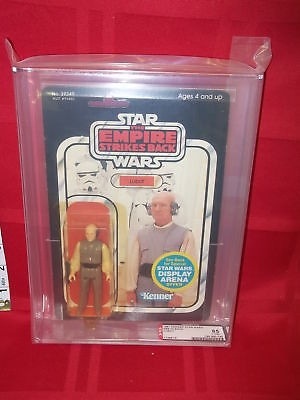 But as we shun him to the dark depths of the HOF we also celebrate what might have been the most DT Luke filled month on Ebay, as we saw four unique graded versions sold over the past several weeks. 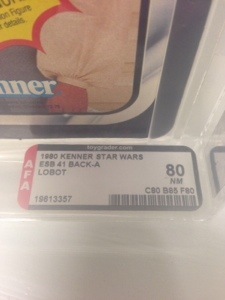 What’s interesting to me here is the variance in price points from the first AFA80 to the last. These types of scenarios can be fun to play with as we have more comparative data then we typically do month to month and year to year. 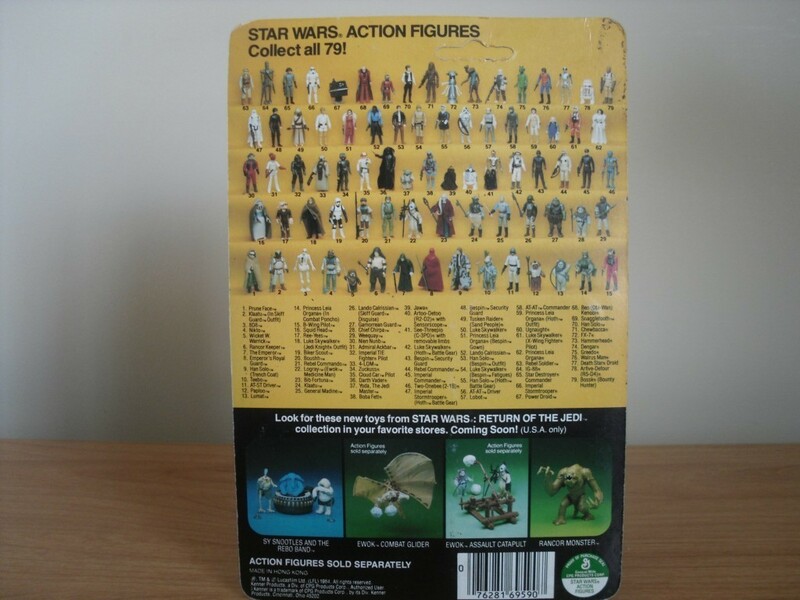 Condition is a key factor as we can see the variance between the 75 and examples of 80s that are present. This is present with every figure out in the market to some extent and could be one of the largest drivers of price within a grouping of a specific figure. Time of day – In addition to being the lowest grade example our first auction is also the only one sold in the AM. Now this is obviously not a global statement as I’m looking at the timing for United States, but historically we see higher prices attached to items that are sold in the evening vs. morning, mid-day or afternoon. In addition to time and condition there are several sub factors that we could look at, the seller, the shipping charges and a few others, but the two we speak to above seem to be very appropriate given the variances we see here. And with that please light a candle or listen to your favorite ballad as we bid farewell to the Double Telescoping Luke on the MarketWatch. He’s filled some great space and given us some great Wow moments, but his now too frequent appearance on the market and inclusion in several Marketwatch segments, moves him to the illustrious ranks of the Marketwatch hall of fame. 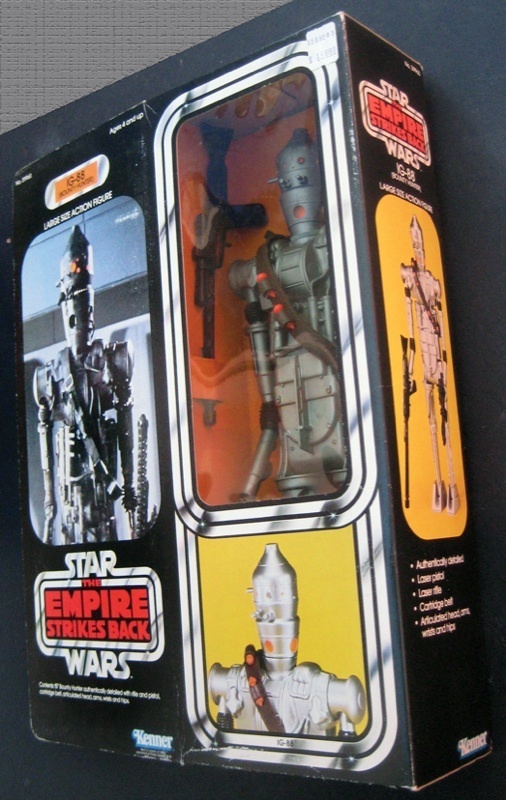 One of the most popular and also the rarest of the 12 Inch figures IG-88 is known to command a premium in the market. In this case we see a very admirable price realized for a great item. We had covered a version of IG-88 in the 12 inch form a few months back. However the condition wasn’t nearly what this piece was and neither was the resulting price point (Sub$1500). This just supports the fact that condition continues to be the largest driver of price within a particular figure, and I don’t mean just a slight increase, rather it’s a doubling or more of a fair example to a near mint example. 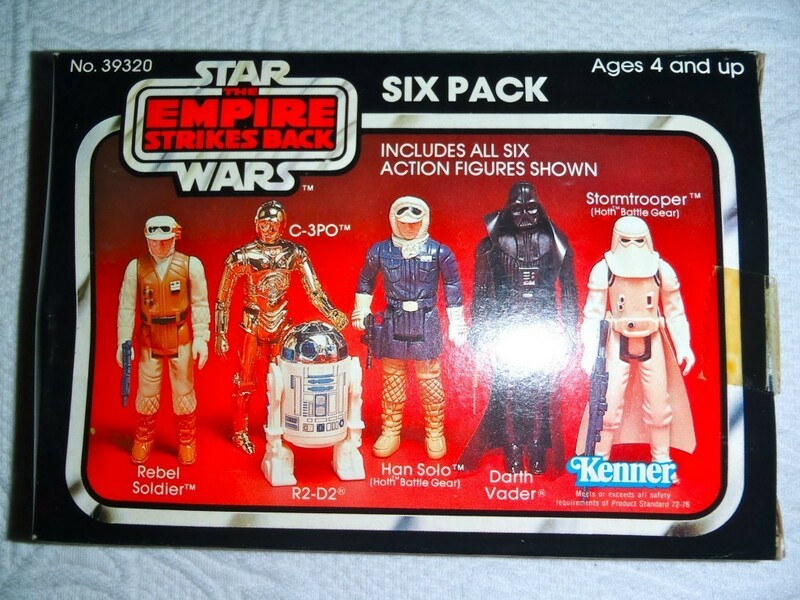 It could be the rarest of all multi packs to be released in mass, the Red Empire Strikes Back 6 pack is an iconic piece in the Star Wars vintage universe. 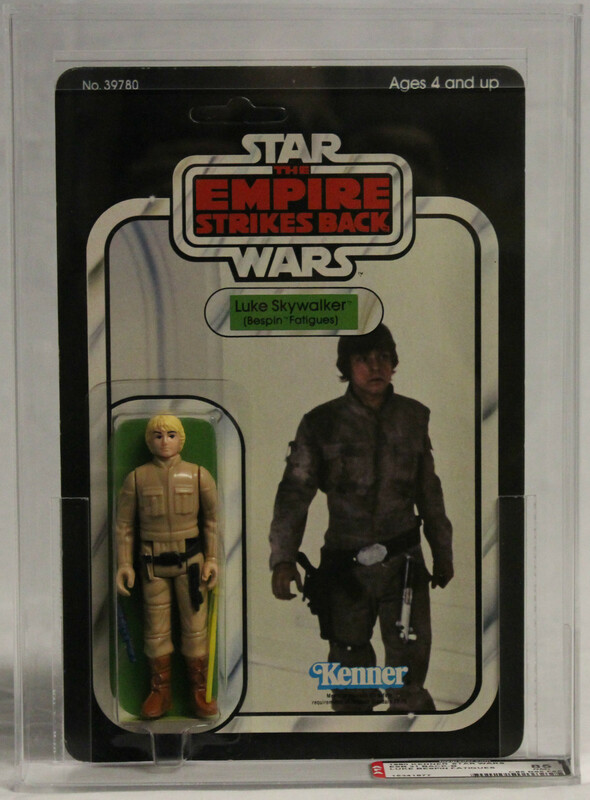 One of two multi packs created for retail during the ESB release these two pieces are highly sought after with vintage collectors today. And why not, great colors, interesting figures and attractive price point that made expanding your figure collection more palatable for those on a budget. Given the short run of both sets and the small number of boxed examples that made it to this millennia, the price and demand for the items is extremely high. 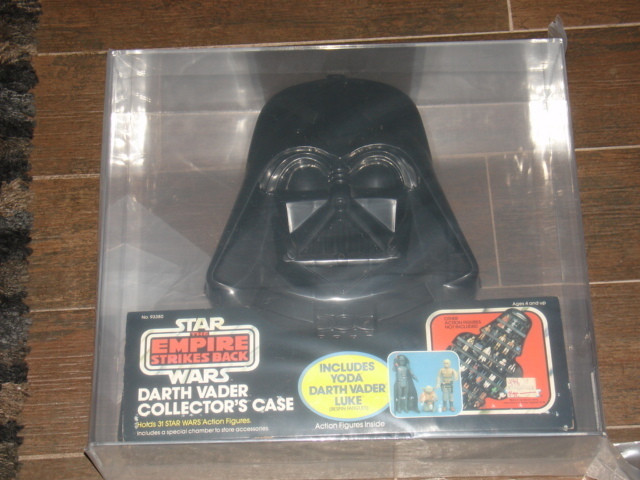 The Darth Vader Case could be one of the most recognizable carrying cases in the history of action figures. It’s been in the background of several movies and was the most popular case from the Vintage Line. 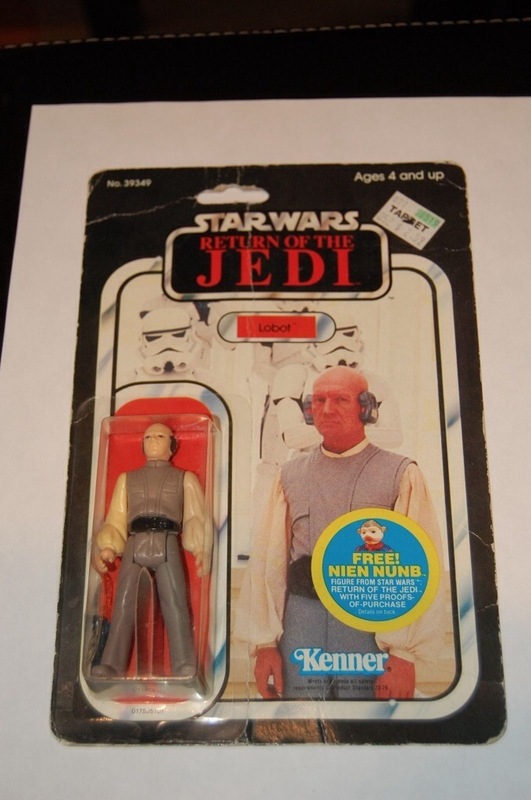 Thus when Kenner decided to diversify the Vintage line they did so with two augmentations of the original item via a bundled solution that was extremely short-lived. 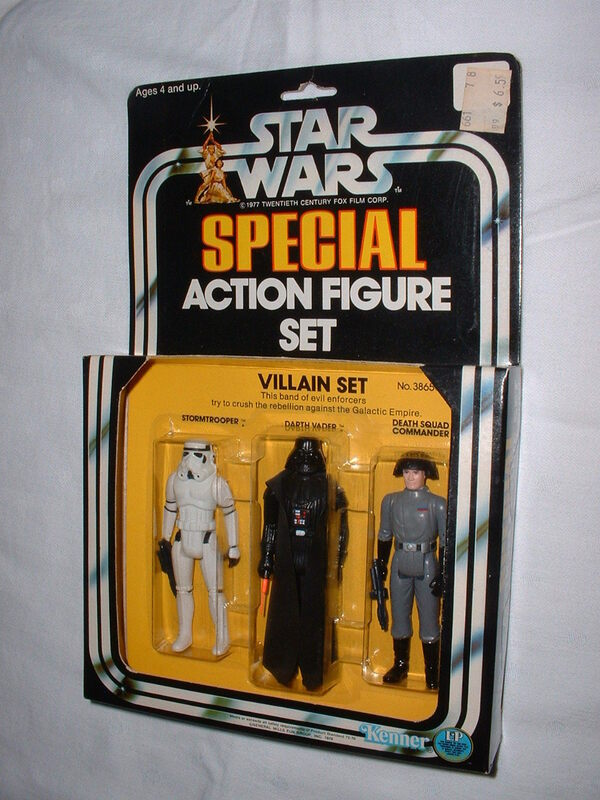 In one version we have Vader, IG-88 and Boba Fett, this far rarer and higher demand version (Due to the figures included) is one of the most sought after pieces in the original release with sealed examples reaching auction prices of $3000 or more in the recent past. 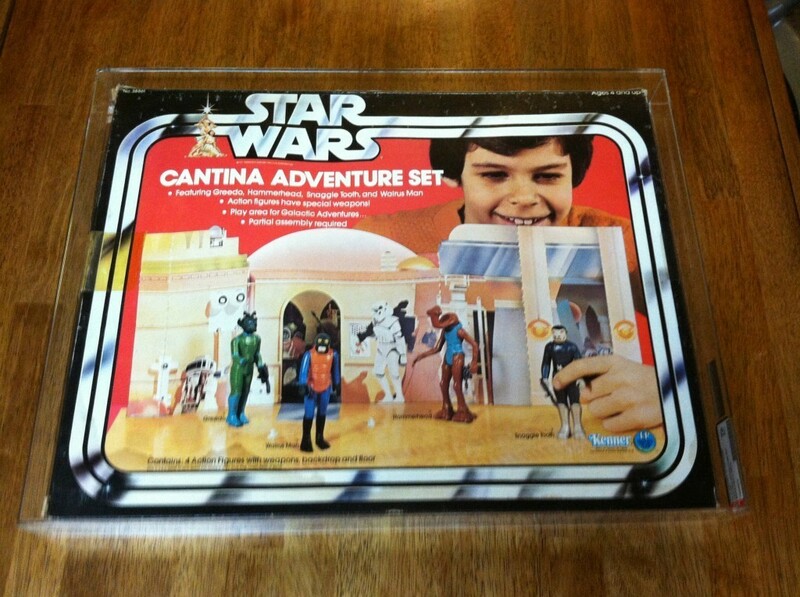 The other version is the one that we are presented with, this set include Yoda, Luke Bespin and Darth Vader. It’s a great example of a piece that we rarely see come up on the market. This particular piece was in very good condition with minimal wear and tear given the age, and therefore drove a good, but lower than average price; given past auction performance. 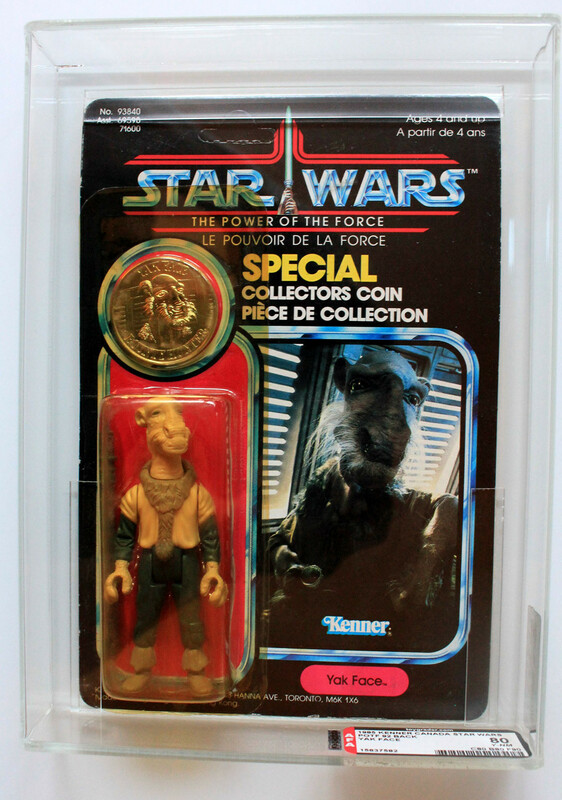 One of the most popular and legendary figures in the series Yak Face a foreign release figure in the POTF line continues to demand extremely high prices for any carded examples. Here we have a nice example of the figure graded AFA 80Y, with a slight yellowing of the bubble which helps the overall visual appeal of the piece. This particular piece was part of a series of high end auctions that also included several of the key figures we’ll review in the Foreign figure section this month. Overall this piece went for a premium vs. historic auctions. The main thing that drove this variance is believed to be the additional traffic that these auctions received due to the number of high end auctions and coverage in a few micro blogs and web sites. 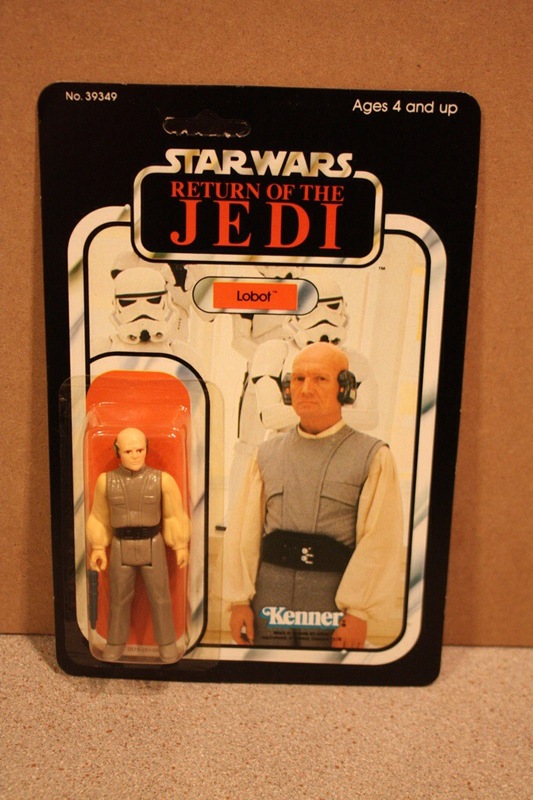 Although he’s not popular enough to keep his ghostly appearance in Return of the Jedi intact for the Blu-Ray, he’s still one of the most sought after figures carded figures in the vintage line. 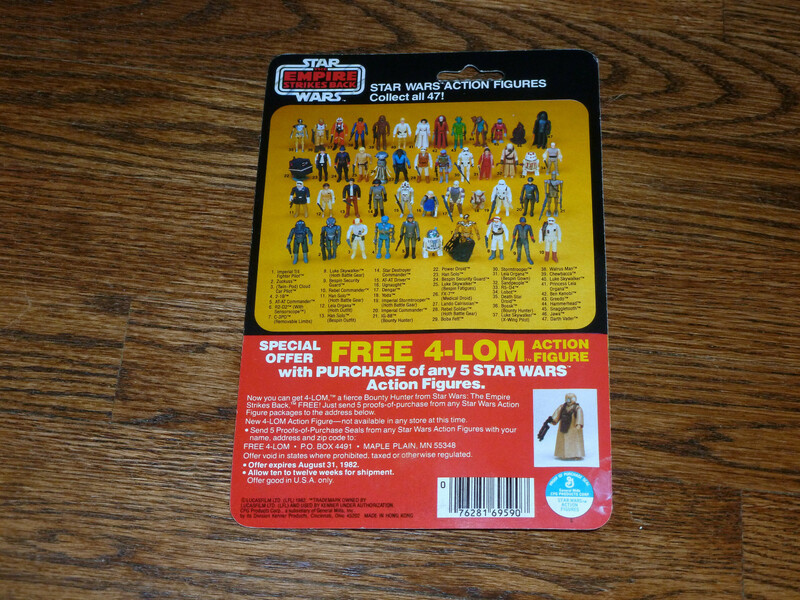 This is mainly due to his limited release globally on the POTF card back. 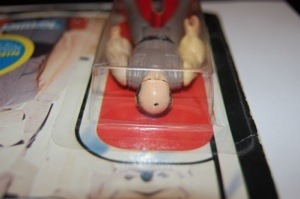 On the other hand the loose version of Anakin is one of the most readily available figures in the last 17 given the mailer offer on the figure. 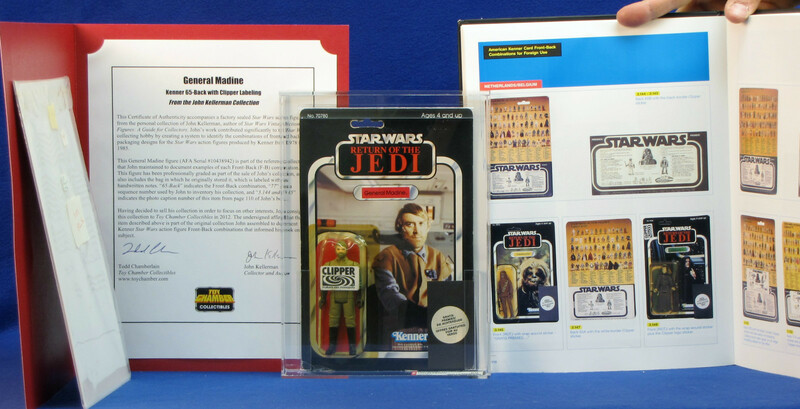 Every time Anakin comes up he’s worth mentioning however given the 3-4 auctions for MOC Anakin’s last year he may also be our number 2 inductee into the hall of fame. 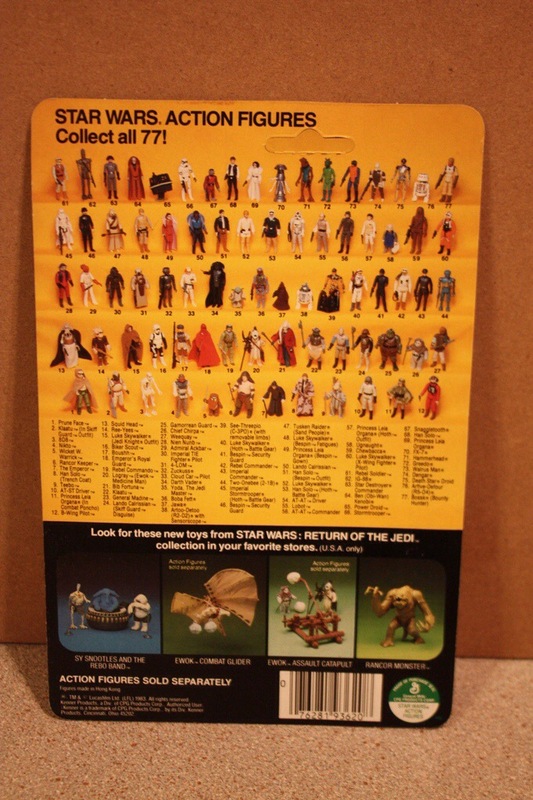 In the world of Vintage Star Wars there are so many focuses that one can have it’s hard to believe that collectors ever get bored with collecting. 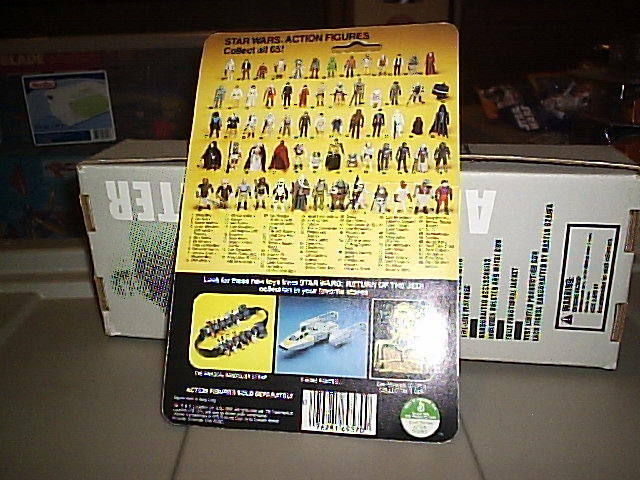 In addition to figure focuses there are several focus collections that play on adjacent products that are associated with the Vintage figure line. 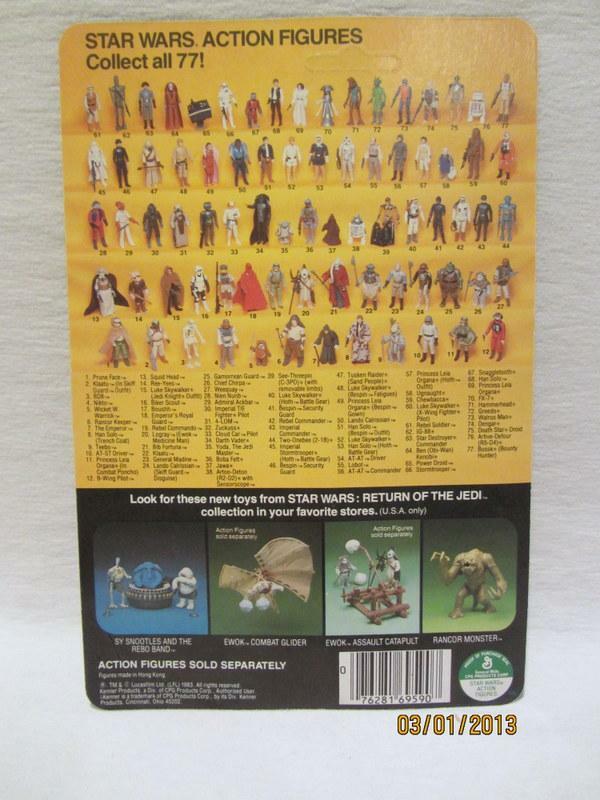 From play sets, vehicles to the 12 Inch figure line there are several options for Star Wars vintage figure collectors to stem out to. 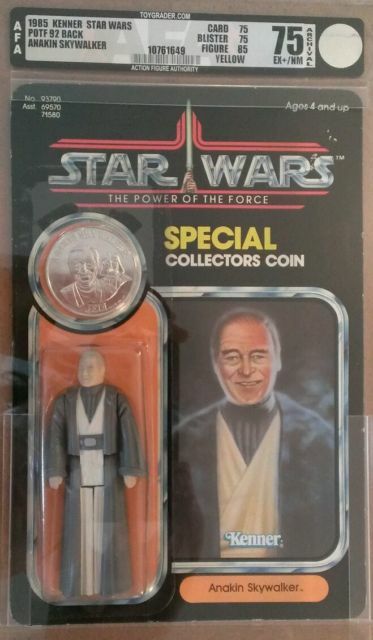 One of my personal favorites to look at is the POTF coin line. 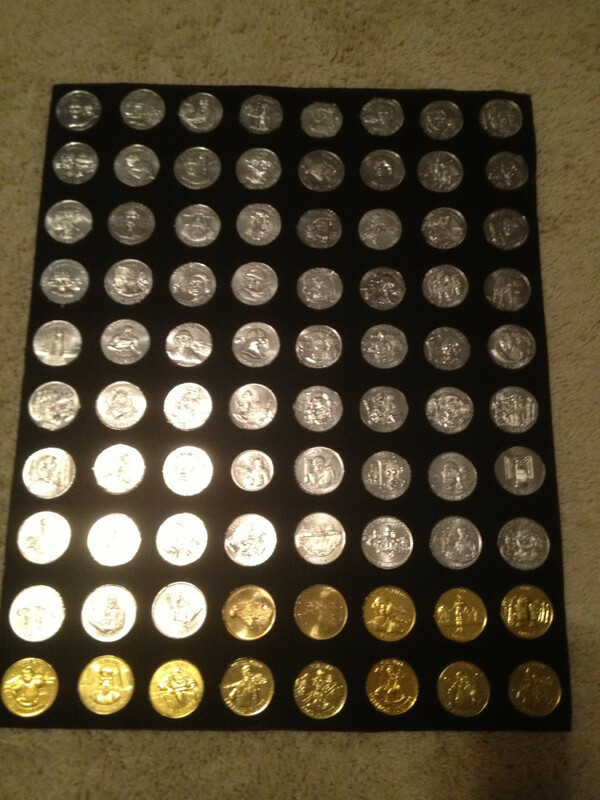 The set of 62 coins (some available via figures and other available only as mail away offers) is quite impressive and popular amongst figure collectors. And why not, the detail is great, there is a good mix of challenging pieces and readily available pieces, and there is a lot of breadth in the line. We’ve covered the coin set at one other point in the past, and since then we’ve seen some strong price appreciation with the example we see here. Of course as any POTF coin collector can attest, buying a set is much more economical (in terms of piecing together a complete 62 coin run) but it’s nowhere near as rewarding as doing the diligence of hunting and collecting each of the 62 coins in this run. Because of the varying rarity of the coins we won’t assign a number to the rarity of the collection, however it’s been rumored that there are as many as 50+ complete sets of the 62 coins in the collecting community, showing that putting together a set is an attainable goal if you put in the time, effort and have the funding to pursue such a conquest. 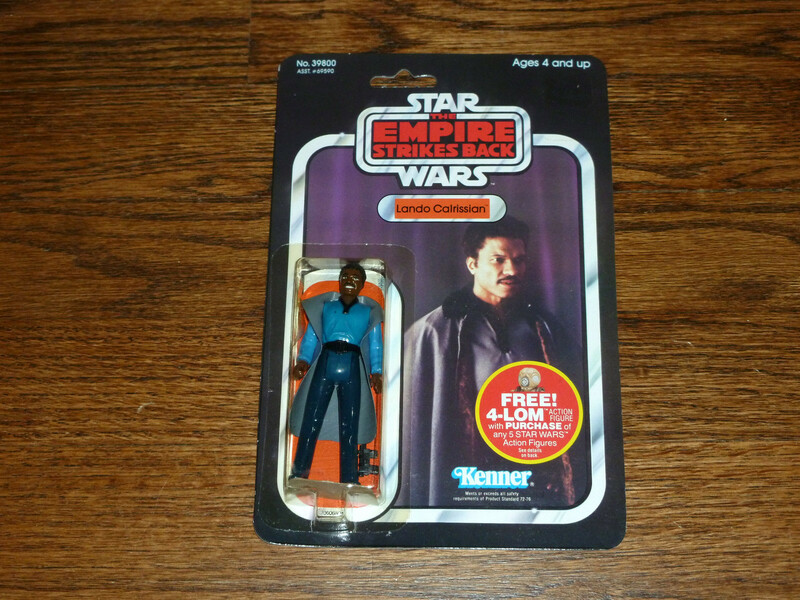 Uzay figures continue to be some of the most sought after figures in the Vintage Series. And why not, if you’re truly looking for something that’s off the wall, novel but at the same time eerily cool, then collecting Uzay may be your thing (if you also have the 3-4K to spend on each figure). 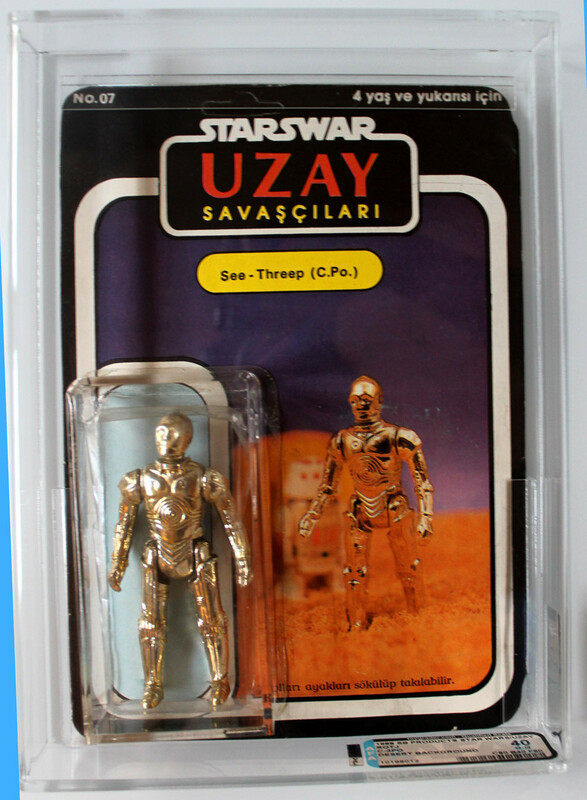 Uzay was a bit off the wall in comparison to other foreign versions of the Vintage series, with unique figures like Blue Stars and Headman, or card backs that feature vehicles that weren’t in any movie and don’t resemble any toy in the series (i.e. Tie Fighter Pilot Cardback) it’s quite the unique series. With finds still occurring today we see this segment continuing to grow in terms of value and popularity amongst vintage collectors. In fact Uzay may be the hottest property in the Vintage community today and as of recent years. It doesn’t come at a price point that allows all collectors to get into the product, rather the price of entry puts some steep barriers around collecting the line. Thus making the collecting of Uzay’s up there with collecting vintage Rolex’s and Faberge. 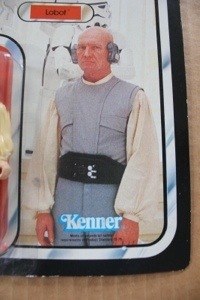 This month we have an example of an Uzay carded figure that was released in the main vintage line. 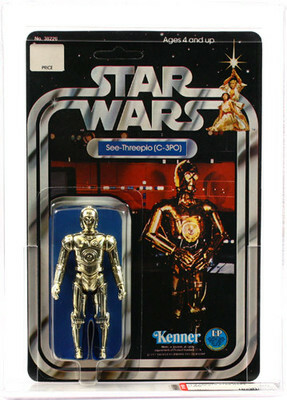 C-3PO maybe another novelty in the line; given that it features R5-D4 in the image, a figure that was never released (at least to my knowledge) on an Uzay cardback. The scene itself is a bit trippy as it features a lot of deep colors and interesting landscape. Overall a very cool piece and right on the money for the market usually bears for these items. 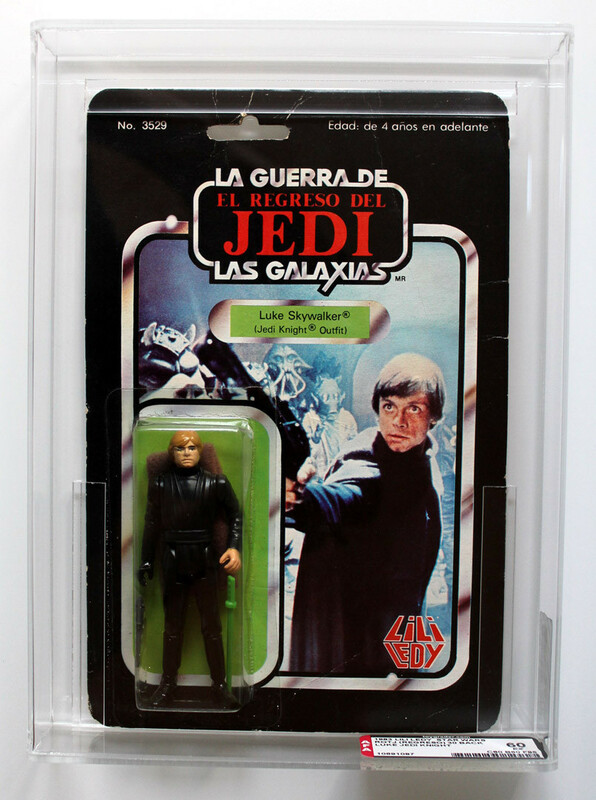 A few months back we covered a few other figures from the Spanish line. 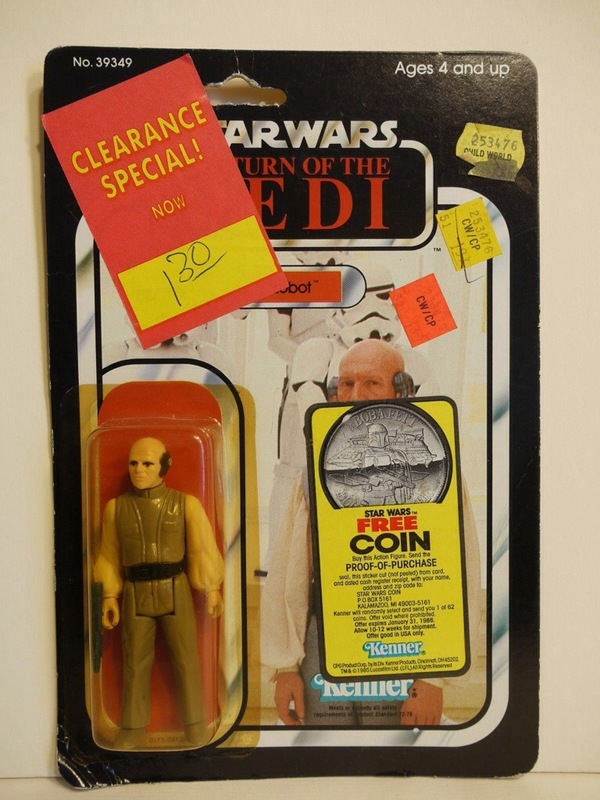 All of which saw incredible price points much like the Luke Bespin example we have here. Although Uzay may be more popular due to the novelty aspect and unique figures released, the Spanish figures could very well be the rarest MOCs in the vintage line. With all examples in the last year selling for more than $1500 a piece even for poor examples these figures are in demand and in short supply as well. For our last pair of auctions in this month’s detailed update we have two Lily Ledy figures with very high price points. Lily Ledy continues to be a major focus for die hard vintage collectors. 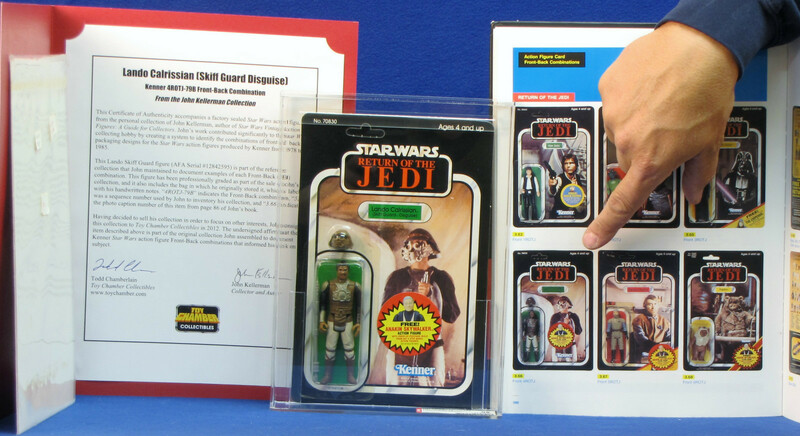 These two pieces along with some of the POTF and Uzay examples that we’ve covered all came from one high end seller that dropped a lot into the market at the beginning of April, including a very cool Greatest American Hero proof card. The two examples we have in front of us did very well overall driving some strong price impression in the market. As we round out the month of April, we wanted to present a few of the notable pieces that were up on the market in the past 60 days but didn’t quite make the cut for the regular show. With that here are some other great noted notables for the month of April! That rounds out the update for the month of April, until next time Wampa Wampa! Happy March everyone, welcome to our monthly installment of the General Update for the Marketwatch. 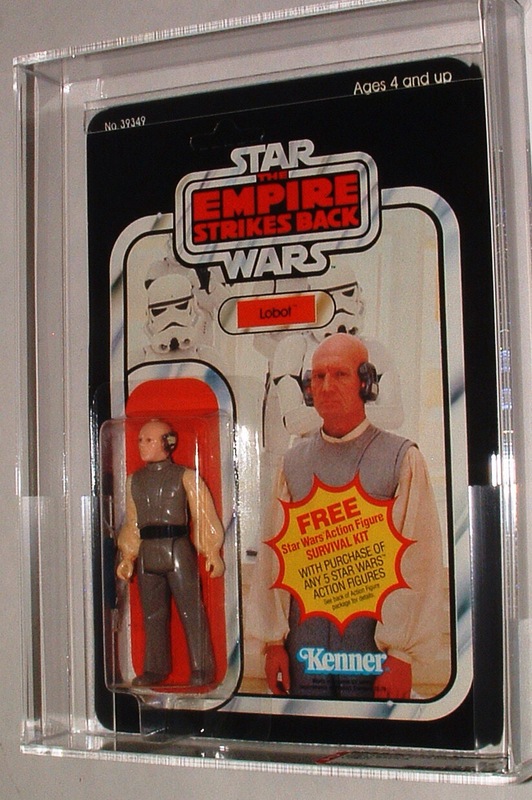 This month we have a special treat for MOC collectors and fan’s of Vintage Star Wars Toys, by John Kellerman. 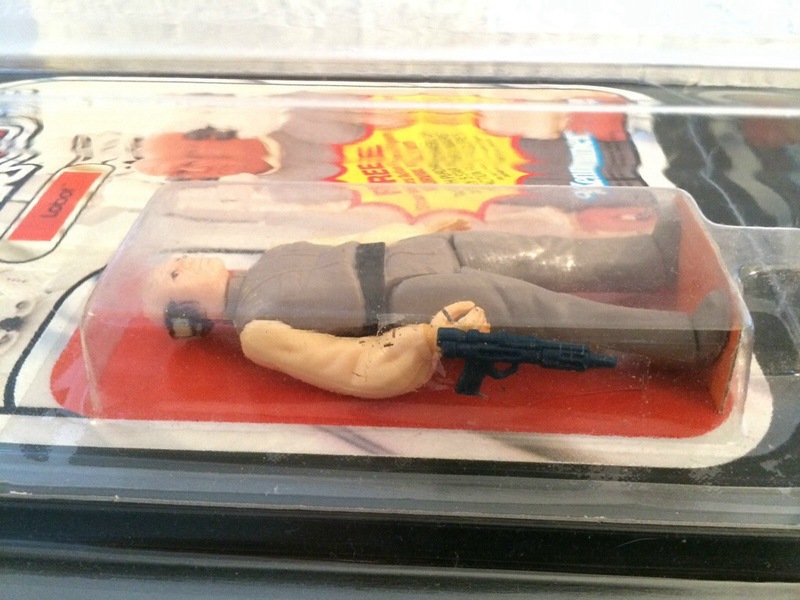 A review of Jeff’s Collectible’s auctions of the Kellerman MOC collection! 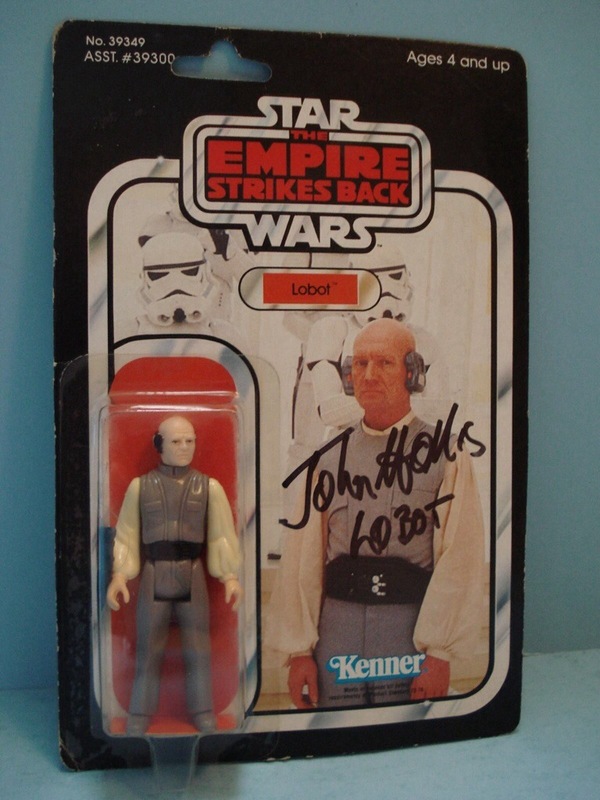 Not only is it special for the reason of seeing some great and iconic items, but these pieces truly stand out given the overall popularity of John Kellerman’s book and legacy in the Vintage Star Wars Community. At the center of the Kellerman universe is his written contribution which is extensive, meticulous, but also very focused as a whole. 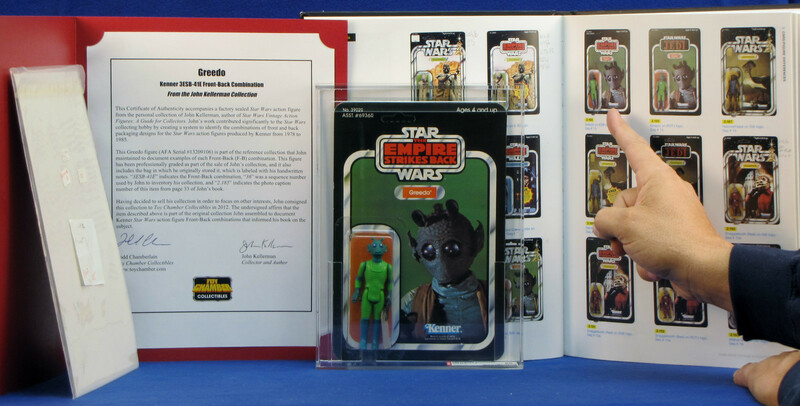 “Vintage Star Wars Action Figures” by John Kellerman is the quintessential reference book of collecting for the Star Wars vintage community. The documentation style and use of large and vivid photos was at the center of the success of the book. It fed information to old and new collectors alike and offered so many data points it still stands as the most well documented printed reference 10 years after its initial release. With a second release pending the stock around John and the Kellerman collection as a whole is at an all-time high. Thus it’s a great honor to get to highlight some of the pieces featured in the first edition of the book here on the Marketwatch. Before we get into the auctions I hand I had the opportunity to chat with Jeff Jacob (over email) earlier this month to get some of this thoughts on the auctions. Thus straight from the proprietor himself, here are Jeff Jacob’s thoughts on the Kellerman collection auctions. Q: How did the auctions perform to your expectations? A: The auctions did well, but there was a lot of time invested to get these to the market not to mention I paid way more than I would ever pay to buy something just to sell it. Q: What was your favorite item up for auction and why? A: 12 back Vader as I have never owned a 12 back Vader with the SKU( I have had around 25 12 back Vaders go through my hands but never with the SKU) so I had a feeling it would go for good money. All the Vaders did well. The only piece that did not get paid for was the 12 back Ben. Q: Did you keep anything for the Museum? A: Yes 21 back Luke with secret figure offer, Sand People 21 back with secret offer and, ds commander 21 back with secret offer, as these were the reason I wanted to look at all of them at celebration. Q: A lot of items that were associated with the LFL collection haven’t held their value in comparison to some of the original going rates, do you think the items here will have a similar effect on value? 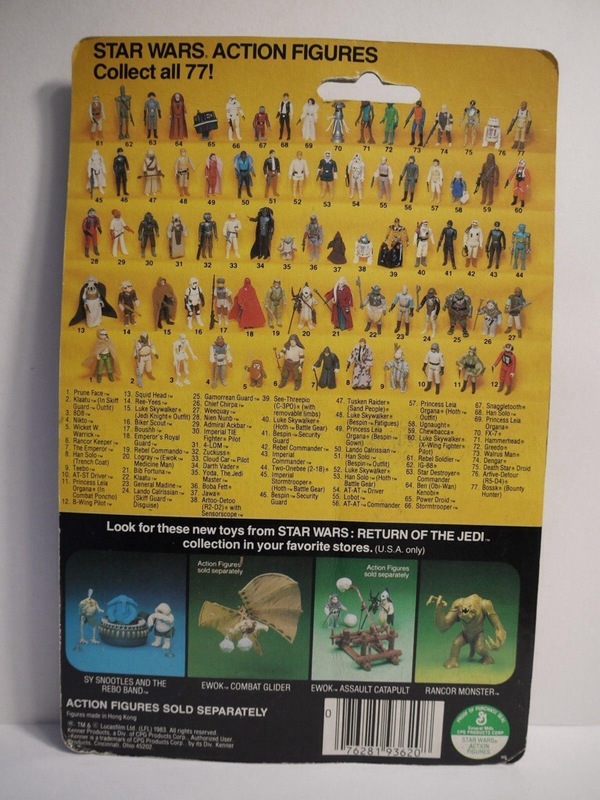 A: Lucas never collected the items that were sold so there was no connection but these figures were used in the grail book and they were part of John’s collection so I believe they will do well over the years to come. Q: General thoughts on this, I’m guessing there was a lot of personal vested time here, thus I’m curious about any of your experiences that you had with the process that stand out for you. A: Just that I will always remember CVI for a long time as it was fun to find these and have John document them and then sell them. I just want to thank Jeff for taking some time to answer our questions on the auctions; it’s always a pleasure getting to converse with him. Chiming in on his experiences as a buyer and general thoughts on the collection is my fellow Martketwatch cohort, Brisbane Brisbane Mike. When I heard Jeff talking about these figures in his interview with Skye I was intrigued. The Kellerman book is most often looked at Star Wars reference book. Such a useful book, particularly if you focus on a character – great way to learn what’s the difference between a 48B and a 48C. 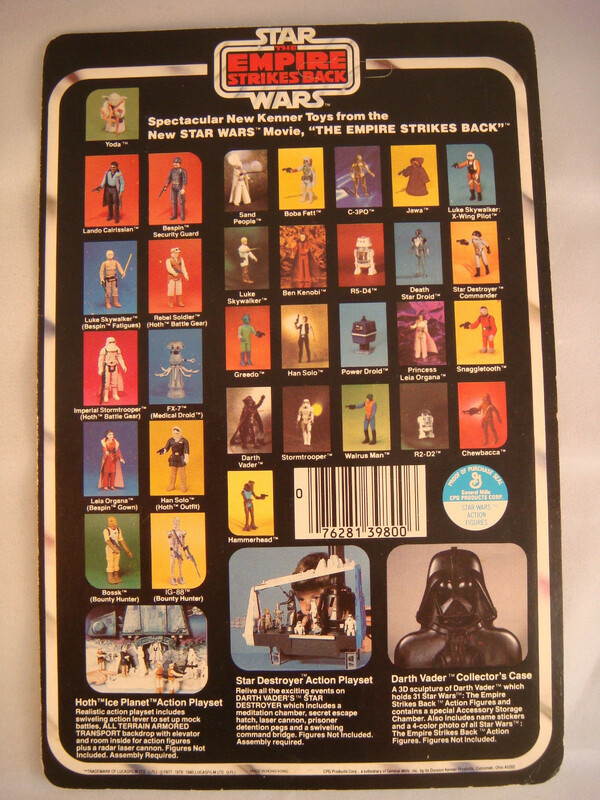 I honed in on a few of the ESB carded MOC’s Jeff had listed. 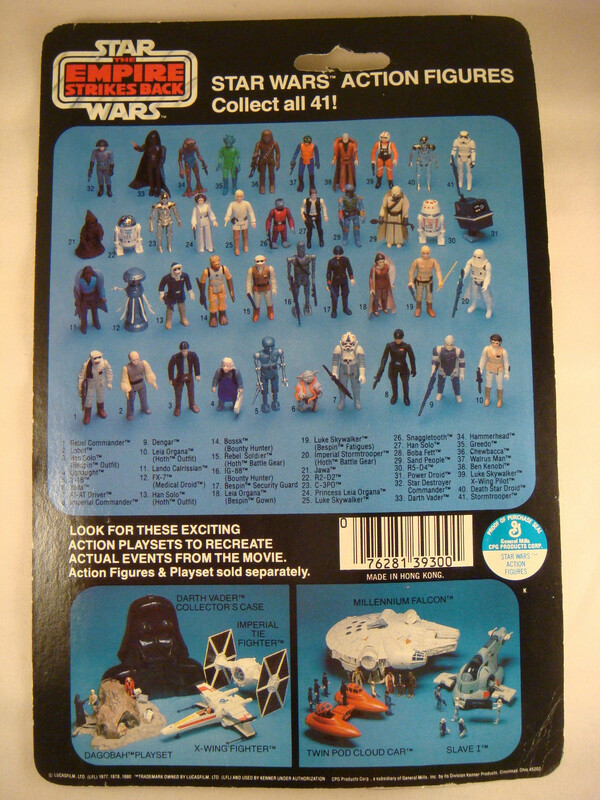 The 48 back R2-D2 was my main objective. It had a good level of bidding, lifting up from Jeff’s opening price of $240 to its ending price of $355. There were no other 48 backs selling in recent times, but a 45 back sold for around $400 while a 41 back graded R2 sold for $242. 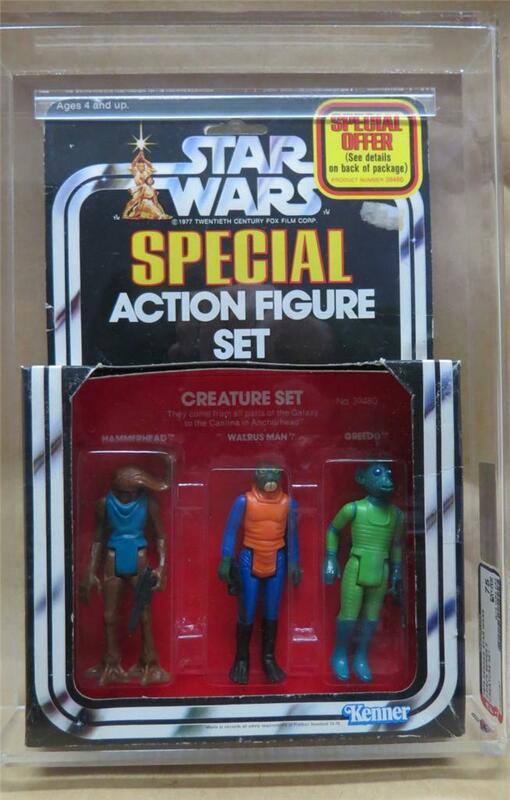 I’ve found the 48A’s a little hard to come by, and for the more popular characters bidding can be quite strong. 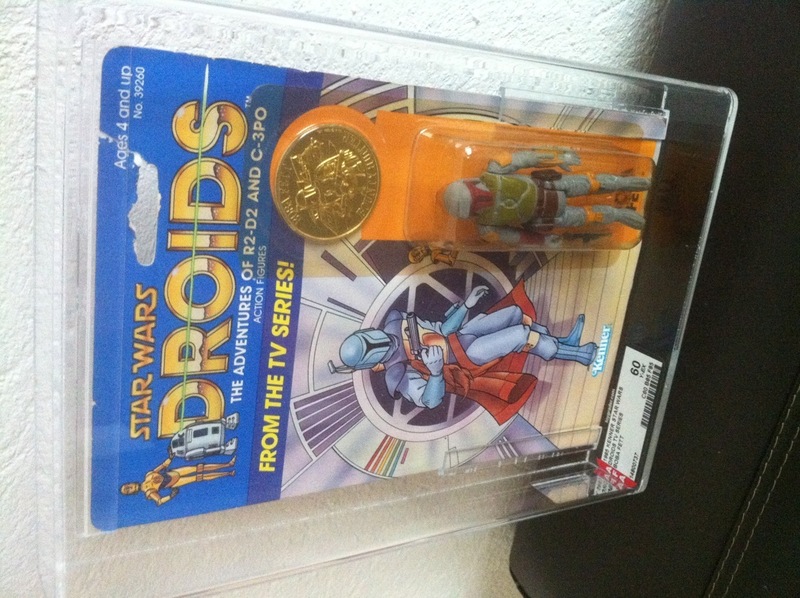 So all in all I’m happy with the R2-D2 and the little piece of vintage Star Wars collecting history he represents. 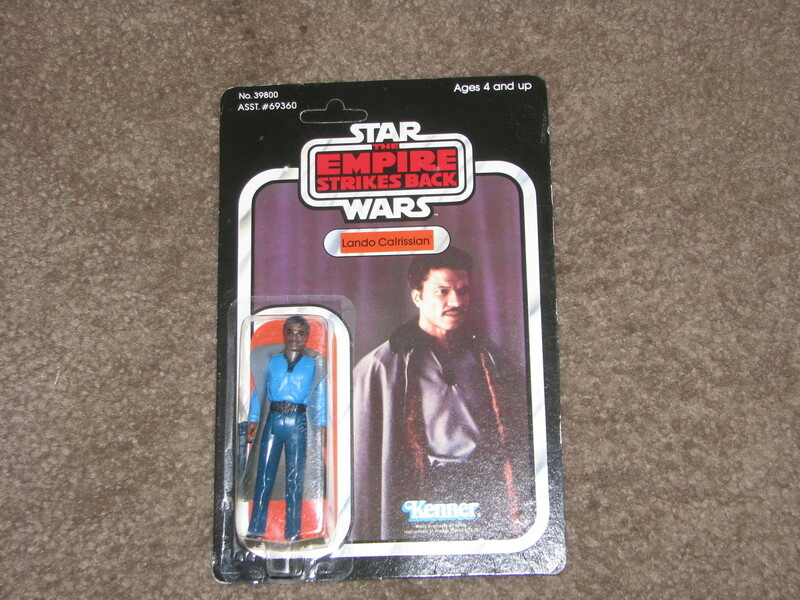 After I won the R2-D2 I jumped in on a few other ESB carded figures. I ended up being the only bidder and ended up with 3 of the MOC’s in total. They all have a distinguishing element, such as a price sticker, such that it will always be recognizable from the Kellerman book. 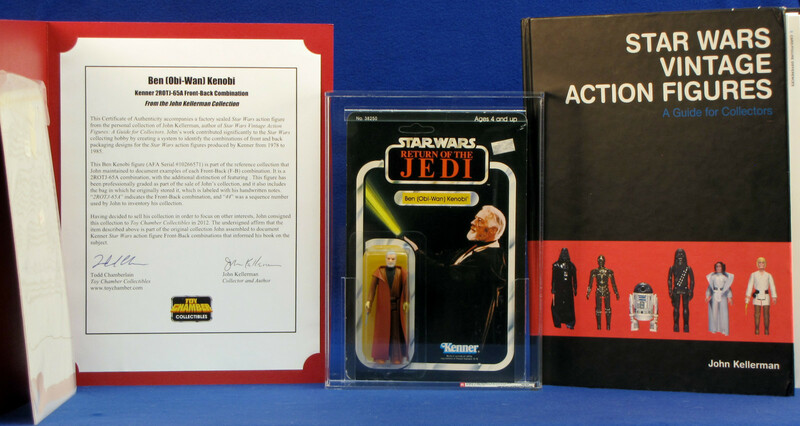 The auctions feature items that were highlighted and used in the production of John’s first book. Jeff purchased these items and brought together and executed on the idea of having these documented. Thus following the grading of the items Jeff worked with Todd Chamberlain the original seller of the items to produce a unique packet for each item. Each of the pieces is documented as to how it was used in the book on a letter signed by Todd, and John Kellerman himself. 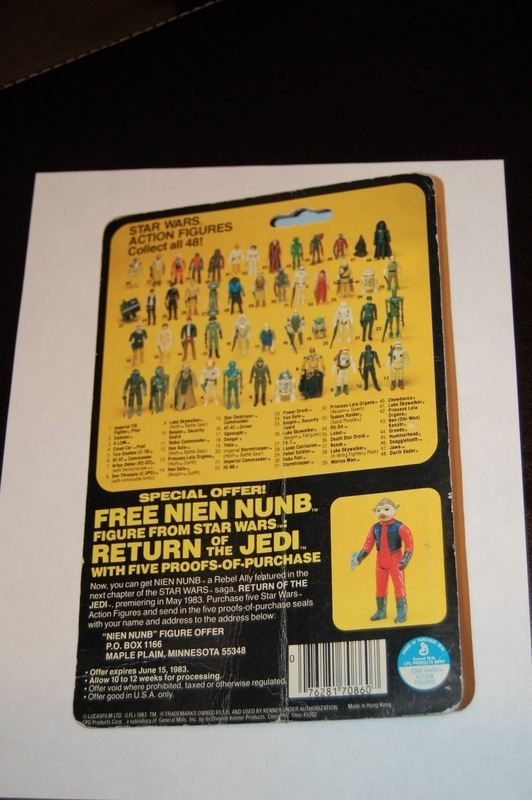 Additionally each item includes the original numbered baggie used to store the figure in the massive Kellerman collection. Rather than reviewing each figure we have simply stated the vital statistics for each figure along with a link/image. We’ll cover off a few from each movie in the series with additional comments, where applicable. 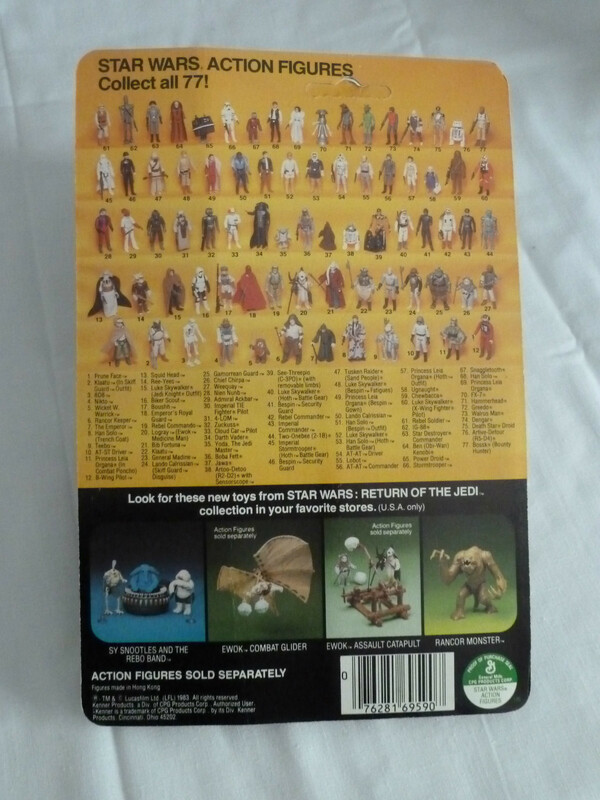 The first section of the review is the Return of the Jedi line, rather than going chronologically I thought we’d go new to old which also turns out to be low to high in price. 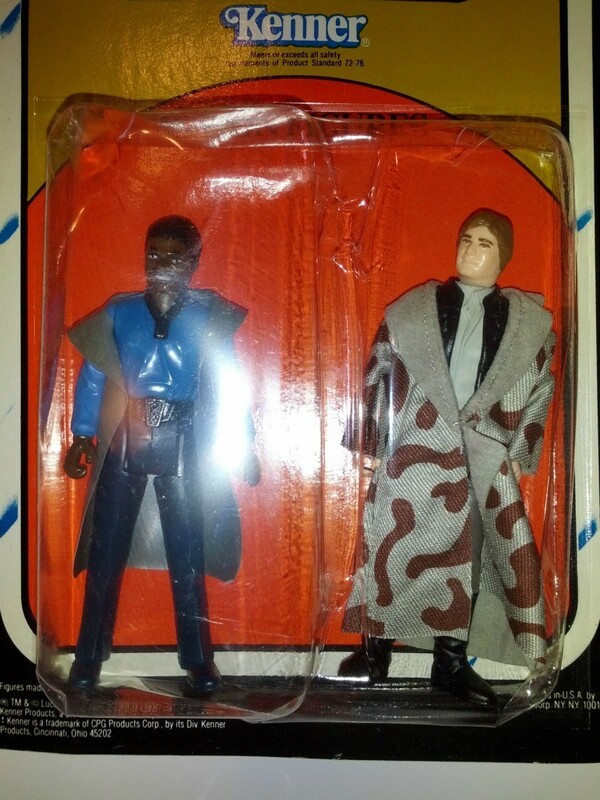 The Jedi series faired extremely well, and showed a tremendous premium to the market prices of normally realized by the “Non-Kellerman” versions. Being part of the smallest figure release in an epic line like Star Wars is something to brag about, especially if you’re a 3 foot tall Ewok. Alas both Paploo and Lumat have the distinction of being 78 and 79 in the original release. 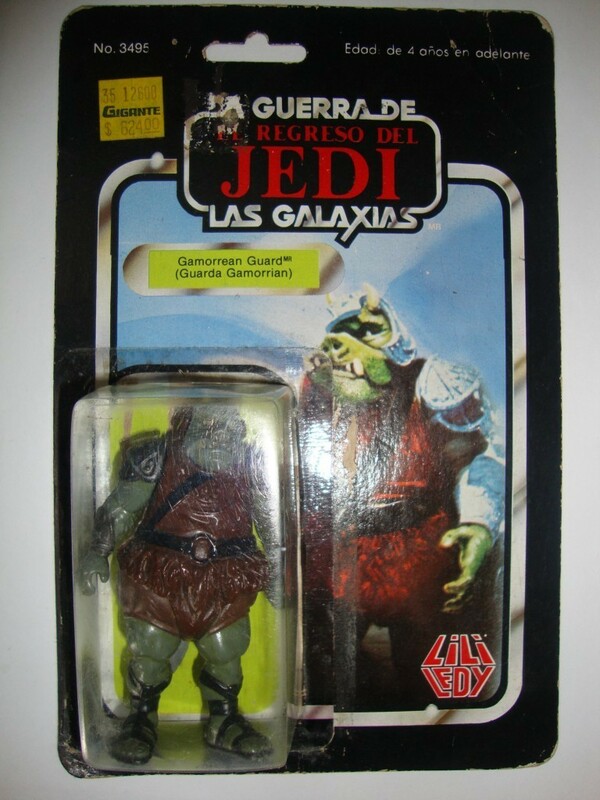 Here we have a great example of the Paploo figure, I always thought he was one of the best molded and designed figures of the original Ewoks. This specific item drove a hefty price in comparison to a non-Kellerman example which would see $125-175 on the high end. 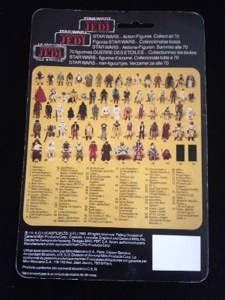 But in the end this is a great example and for the ROTJ line one of the only examples used in first 79 section as opposed to a specific variant or backer as seen with Biker Scout and Ben Kenobi. 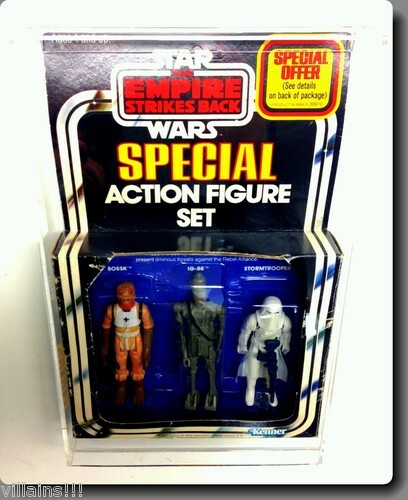 The Empire series continues to be one of the fan favorites, therefore it’s not surprising that we saw a lot of movement in the ESB auctions. 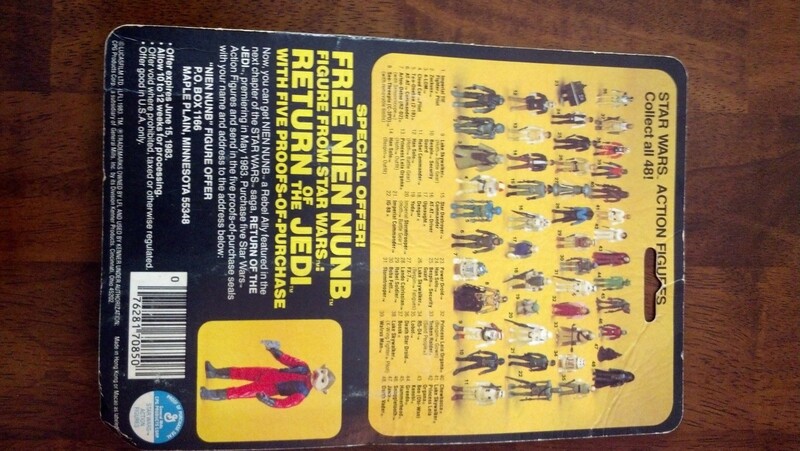 Jeff offered up a lot of variety here doubling up on a few characters and expanding the total auction count drastically over the ROTJ listings. Here we see our first $1000+ ending price as well which also happens to be our first figure in the review. 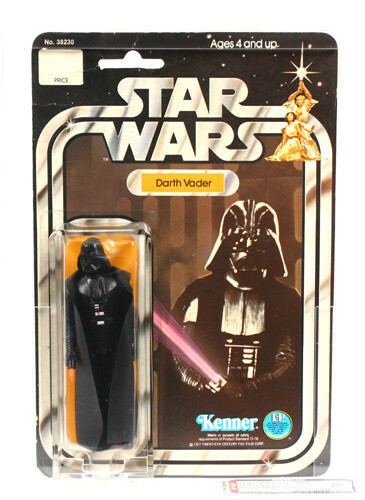 Darth Vader continues to be one of the most highly sought after figures in the original series, he was without any variation in comparison to his rebel counterparts and thus the iconic figure was released across all three lines in the same form. This particular example is one of the rarest cardback combinations out there and surely made the year for a Darth Vader focus collector. The final price of $1126 was really in line with what one would expect given recent values on other more difficult to find Vader examples. 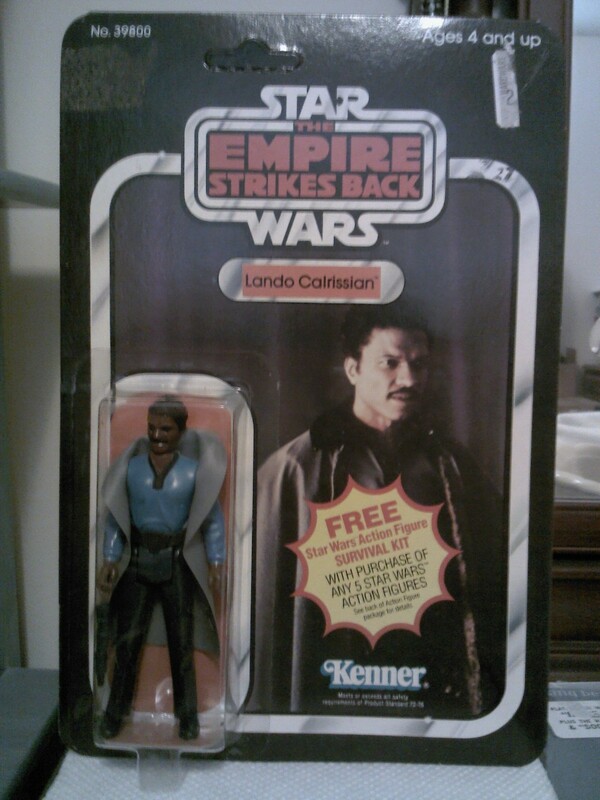 A great piece and a great peak in the ESB line auctions from round 1. 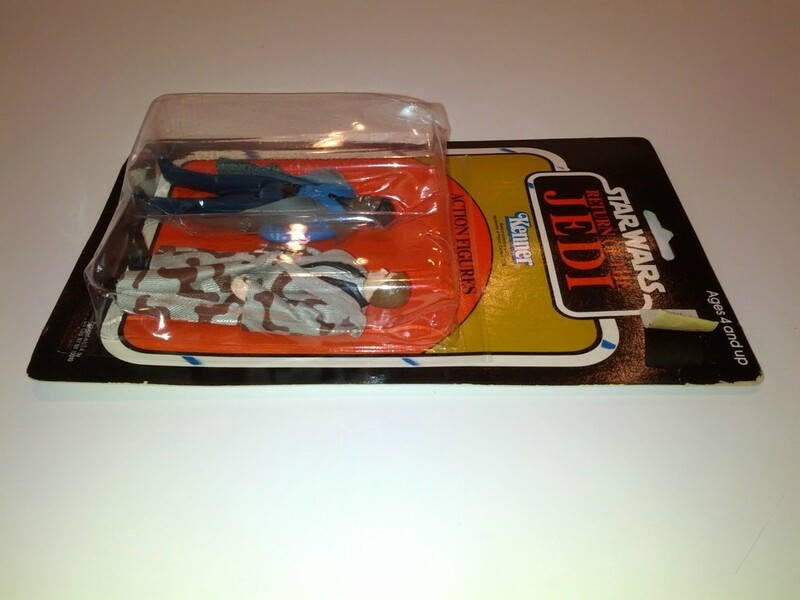 One of the only cardbacks to get a full change over the orginal Leia Organa Bespin figure is a vintage collector fan favorite through and through. Along with her brother Luke’s Bespin changeover this figure attracts collectors from all sides of the vintage hobby, variant collectors, MOC collectors, Leia focus collectors and of course ESB focus collectors. With that in mind it’s no surprise that this popular but not too rare figure realized a value of $465 a premium of about $150-200 over a non-Kellerman owned version. 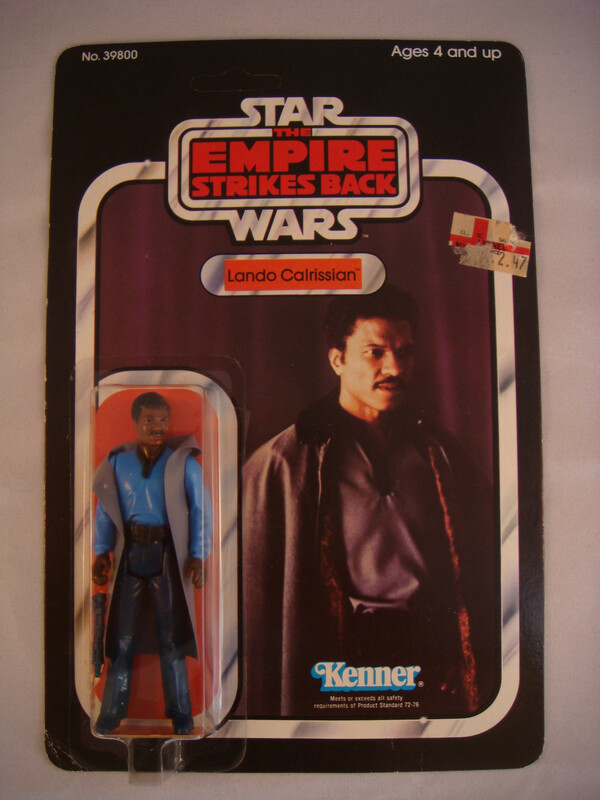 The last figure we’ll review in the ESB series is the first Clipper auction to discuss. Given that John’s collection was so vast there was a lot of breadth in cardbacks and variants at hand. 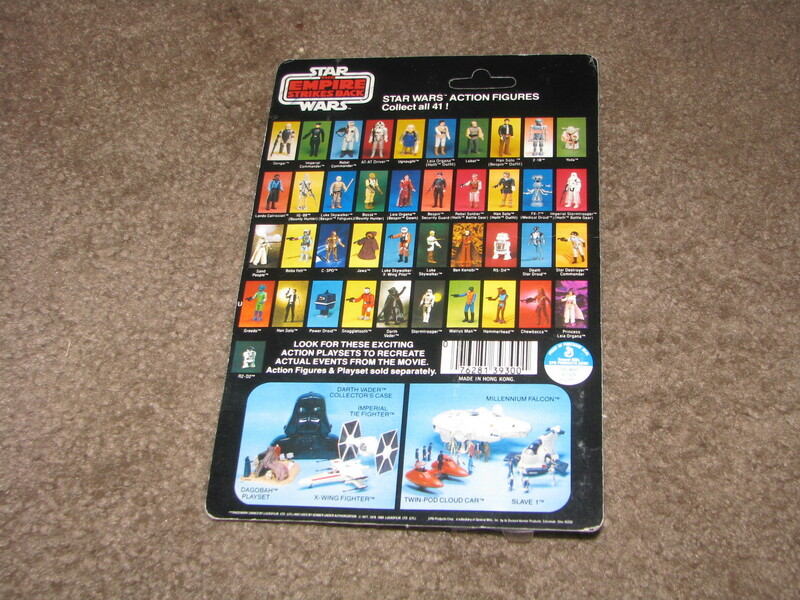 But one of the best segments that we saw arise from these auctions were the few Clipper figures that were sold off across the three OT movies. This particular Zuckuss figure is one of my personal favorites from the auctions given it’s condition and overall rarity. 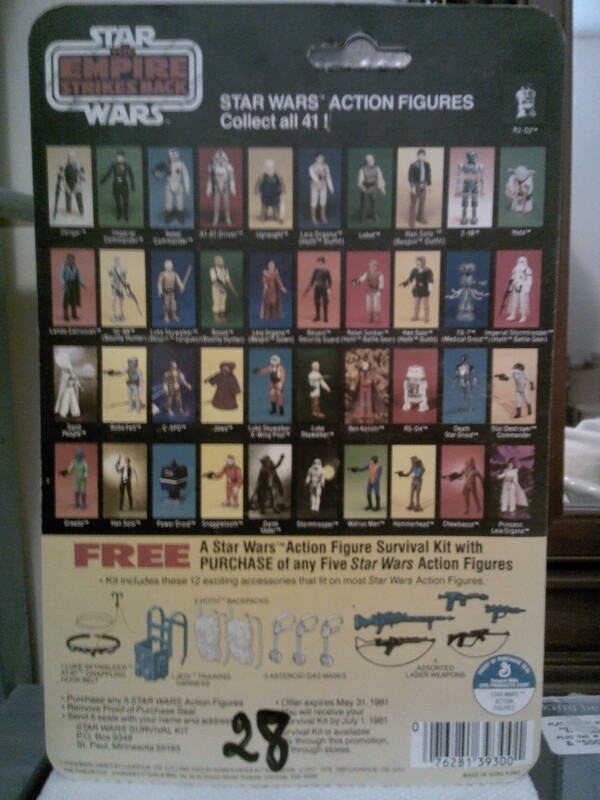 The last and final section covers off the Star Wars figures from the collection. 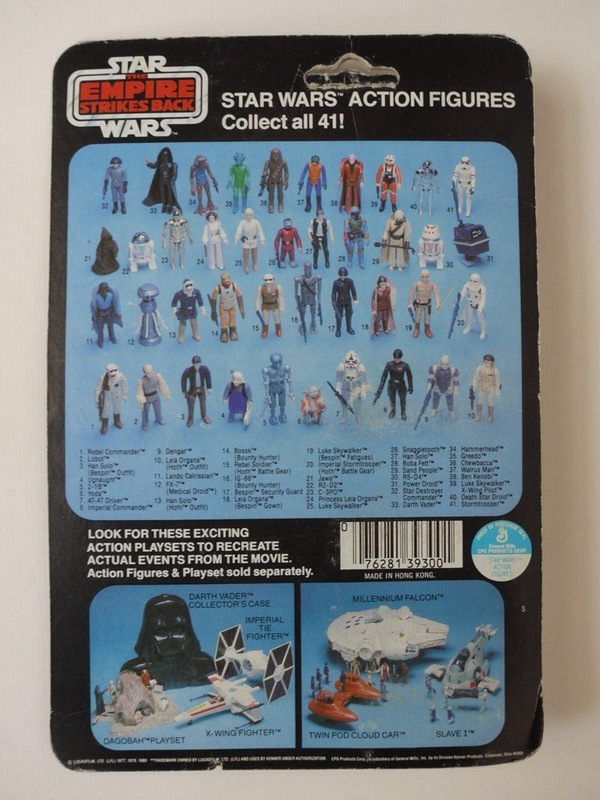 Some of the most notable include the Darth Vader with a sku number variation, a 21 back Vader, and a pair of Death Star Droids. 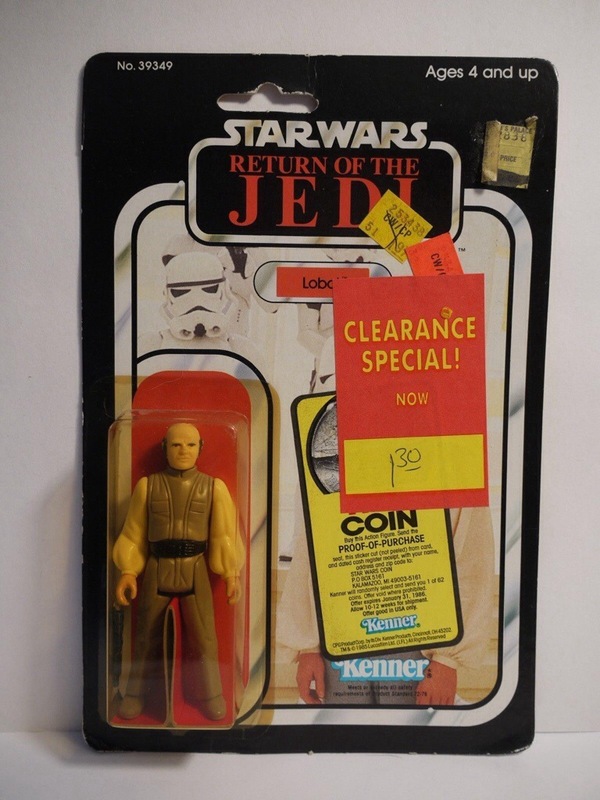 As we move into the Star Wars auctions we find the price points of the auctions continuing to creep up. In this run we saw several auctions go for $1000 or more; in a few cases it’s driven by condition in others it’s driven by the rarity of the figures themselves. All in all this was the most fun set of figures to watch as we saw some really great prices realized across the board. 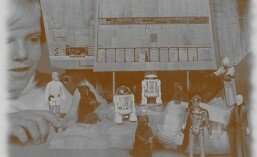 Our first Death Star Droid auction is also our first auction to hit the $1000 mark in the series. The Death Star Droid isn’t exactly one of the most sought after figures in the series, but it is one of the most difficult to find in pristine condition in both the loose and MOC condition. 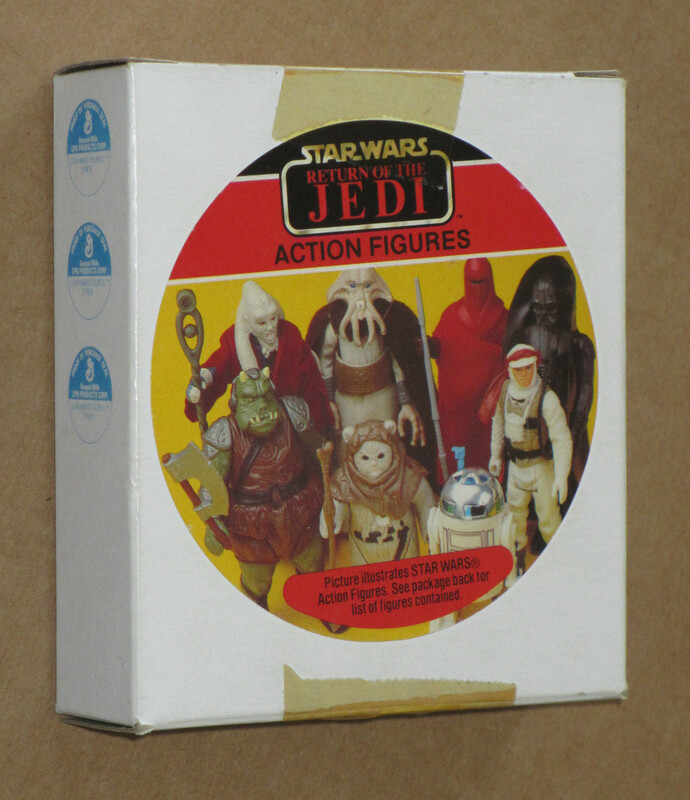 This deals primarily with the fact that the figures’ paint rubs off extremely easily over time. Making 90 or better examples of the figure in either MOC or Loose form extremely tough to come across . Thus I believe condition is the overriding factor in the price realized here for this 21 back example, which isn’t the easiest to find, but for an 85 or 80 I don’t think you’d come even close to the price we see realized here. 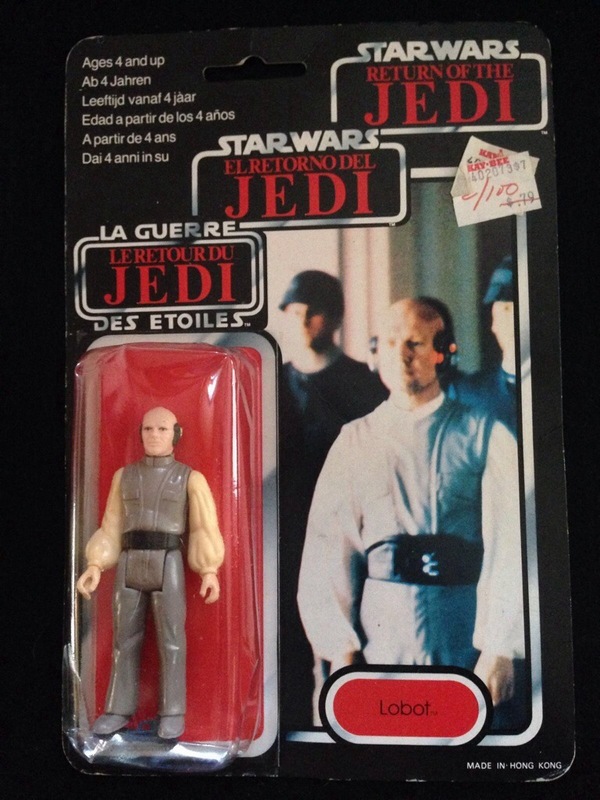 Our last figure in the Star Wars series is also the crème del a crème of the series. 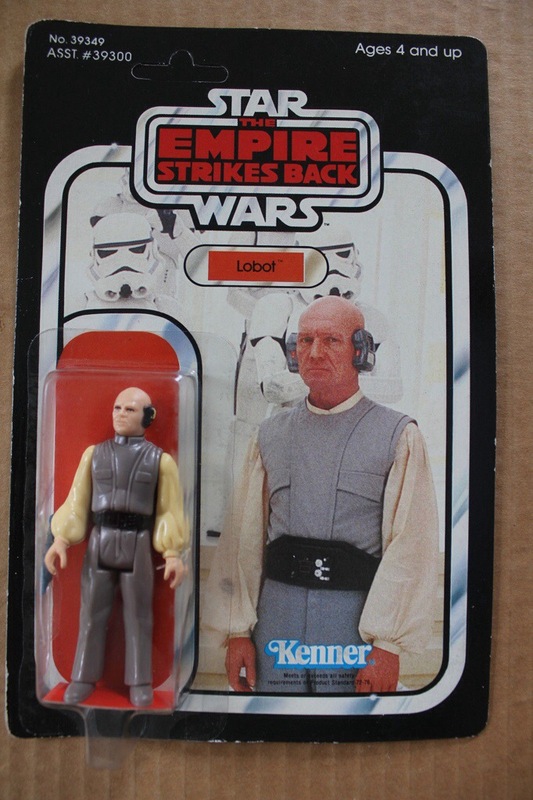 Not only do we have a great condition example of one of the most high demand figures in the current market, we also have possibly one of the rarest cardbacks in the series as a whole. 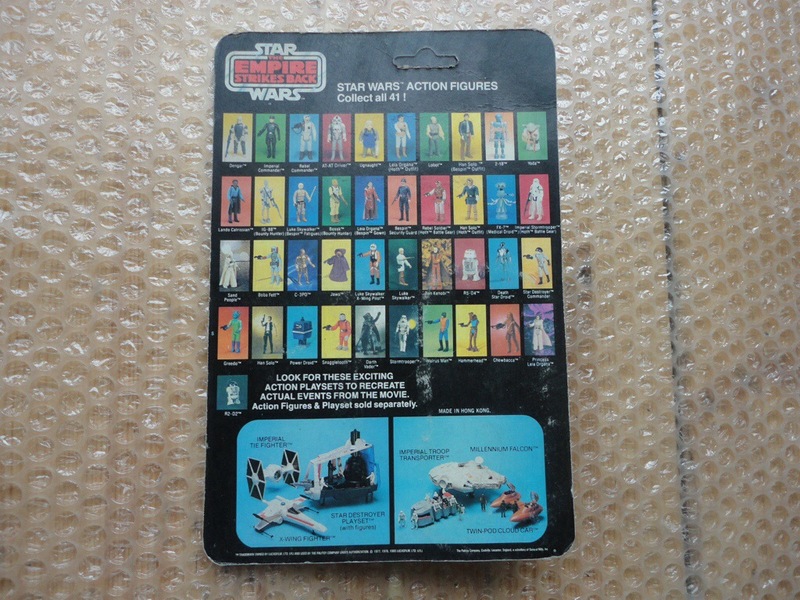 This segment of cardback collecting and MOC collecting isn’t breached that much, why you may ask; because there simply are not many examples to talk about when it comes to Star Wars figures with the sku variation on them. 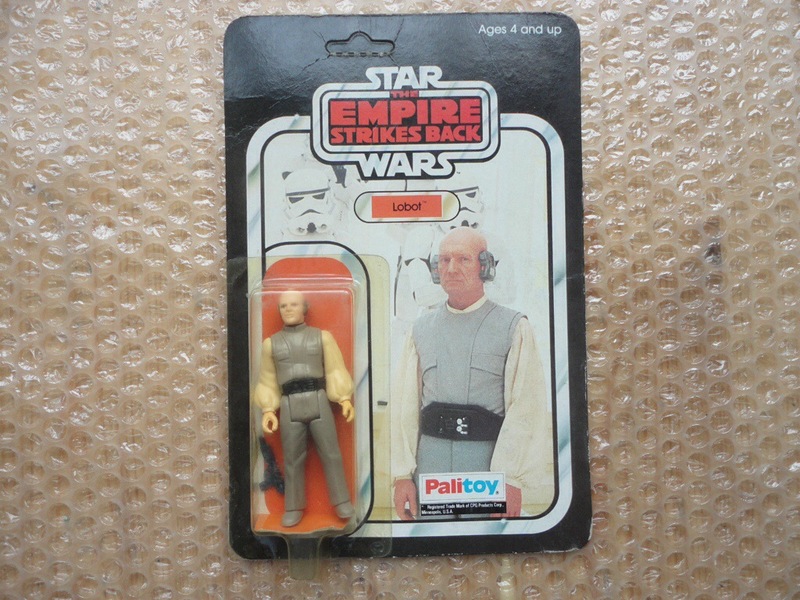 This piece has been exceptionally cared for and the realization of a selling price of $6100 puts this figure in a league with the rarest of the rare in the Star Wars universe. As typical in the eBay universe, we didn’t see all the items go in the first round of the auctions. This is mainly due to the starting prices invoked on these in the first round, as they definitely moved when they were put up as .99 auctions with no reserve. What surprised me about the second round of auctions was the prices realized on a few of the pieces. It’s truly supportive of what I refer to as the price/value perception phenomena \. This occurs when you set something to a full fledge open auction, .99 starting price with no reserve. It’s an oddity that produces higher results then when things are listed at a FMV starting price. It makes little to no sense conceptually, but its present in several of the auctions we see below. 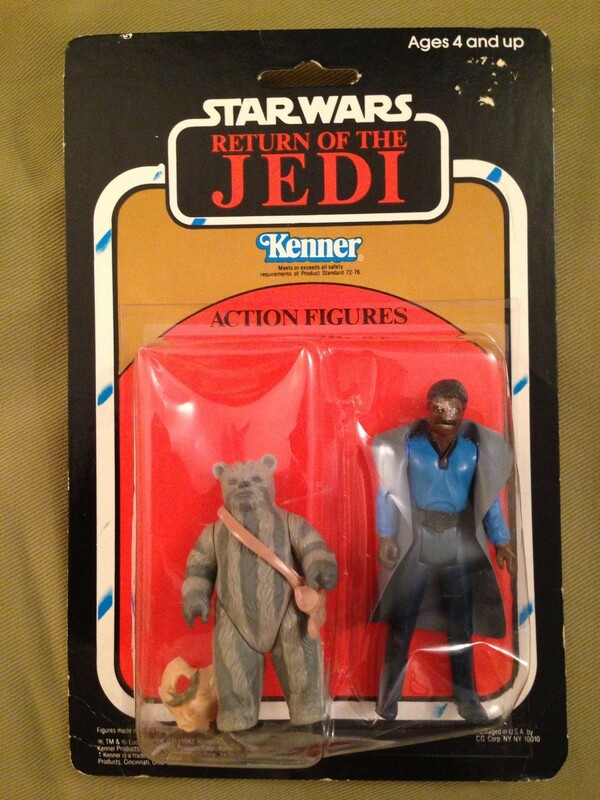 One quick example is the ROTJ Ben Kenobi that was originally listed at $199 and didn’t have any bids the first round. In the last round it actually demanded a price of $250 with bidding lasting up to the last minute. Overall it was great to see the prices realized below. It truly shows that there is definite name recognition and prestige that are put with these pieces. So overall we saw some great things happen here. 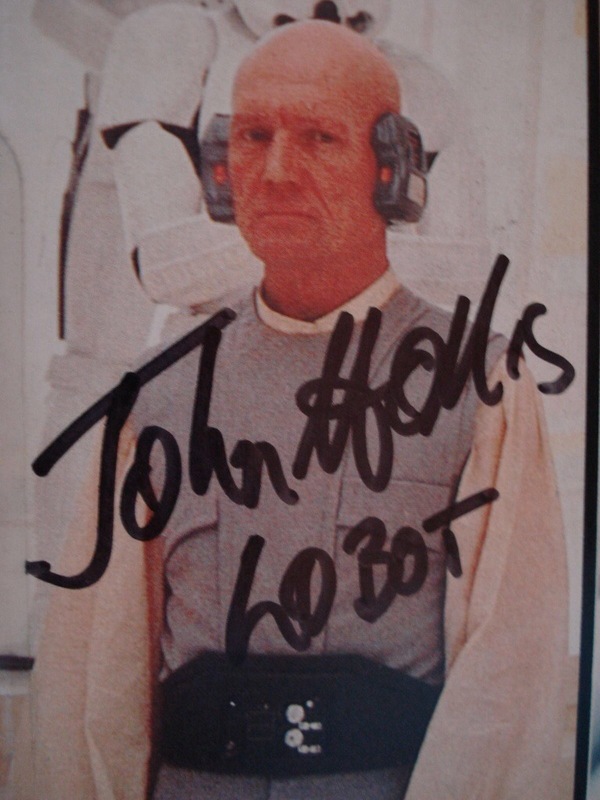 We saw a lot of incredible above and beyond prices realized which enhances the overall persona around John and his contributions to the hobby. 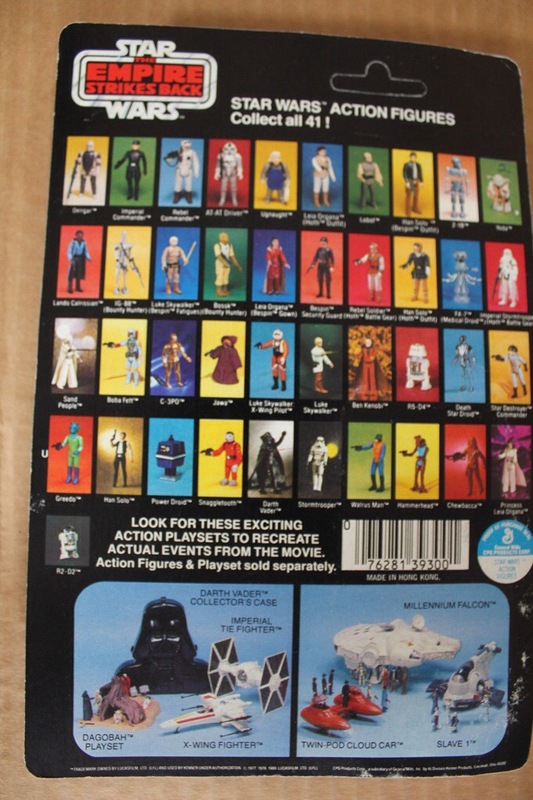 In closing this was a truly historic moment in Vintage Star Wars collecting and it’s great to see such a positive outcome from the listings as a whole.